Keep in mind that the sale-prices may be from any time 2001 to present! Lots of style! Made in Italy, looks like similar parts as some pre-Baldwin Burns guitars. Nice sound, shorter neck-profile, decent action. Has some issues-- toggle works but pops out (should probably be replaced); body-rear ridge-type cracks. Univox-style single-coil pickups (same size as Hagstrom 60's single-coil's). Asking price- US $325 no case SOLD! Dearmond Goldentone modern humbucker pickups! They sound like the famous 50's-60's Goldentone's but they're humbuckers, so you won't pick up the RF-interferance noise like the original single-coil's. Solid-body, very lightweight, don't confuse it with some of the early Guild semi-hollow M-65's because this model's a near-match. Slightly wider than a standard LP-style body. Tons of fun to play. Genuine Gibson Les Paul replacement-pickguard, otherwise all original parts; bolt-on neck. The orange is a nice Crush-Orange color, very cool looking retro look!. Asking price- US $175 no case SOLD! Asking price- US $425 SOLD! Dearmond Goldentone Dual-Coil humbuckers sound INCREDIBLE! They're the same size as a Gibson humbucker or equivalent, as well. Solid 2-ply mahogany body all-around. Solid 1-piece mahogany neck plus separate mahogany headstock. Superb sustain and depth. Rosewood fretboard. Nut 1-11/16" width, 24.75" neck scale feels very much like a great pre-1966 Gibson model. 8.5 pounds weight. I bought this one brand-new with plastic-covers still intact, from a guitar-store. The threaded-knob end of the toggle-switch tip snapped off, and I prefer it that way because it's on the upper-right bout, and they sometimes get in my way when I'm playing. You can easily replace with a $10-15 3-way toggle if that's your preference. Korean-made, probably Samick. Like-new, I've played this very little -- a few hours on a few recordings in the studio. One scratch on rear in the middle.. Asking price- US $550 ; no case SOLD! This one has the white vintage-style rockabilly Dearmond single-coil pickups on it. With original Dearmond hardshell case. Asking Price- US $950 SOLD! Great condition, looks like someone spent as little time playing lap-steel as I do! Mahogany 3-piece body with solid neck-through-body; original 3-strip tuners have some wear but are very functional. Original cable/cord wired directly inside the guitar to a standard 1/4-inch plug for any amplifier. The famous and mysterious "ElectroMuse EyeBeam" pickup, no-pole single-coil in super condition. Asking price- US $250 with original case SOLD! Near-new, played on one of my recordings when I first got it in 2002, jammed with it once in the studio, that's it. Pretty much like-new with like-new orginal hardshell case. I installed an Epiphone Bigsby which cost me a chunk and works great! The former owner upgraded to official Grover tuners. All-original everything. Pickups- neck is a super sounding Epiphone "New York" Mini-Humbucker (allegedly made by Seymour Duncan); bridge is Epiphone's Classic 57 (CH57). First-year of model (2000), made by Samick in Korea. Asking Price- US $375 with new hardshell case SOLD! Like-New shape! NOT the standard "Dot" model. Gorgeous flamed-maple body! Check the photos! "Limited Edition" decal on back of headstock. Probably the predecessor to the later Elitist edition (currently $1000+) in quality/structure, but lacking the neck-binding. Gold hardware and pickups. About identical to the Sheraton's but lacking the neck-binding and headstock inlay.. The pickups are Gibson-designed CH-57 in the neck (8.48k) and a HOTCH (13.53k) in the bridge. Body & neck like-new, pickup covers & bridge have some typical modest dulling of finish. Former owner installed and then removed a Bigsby, leaving 3 screw-holes around the tailpiece-strap button. No other issues. Slightly stocky neck compared to modern Gibson's or standard Epiphone Dot's. Photos show strap-locks, which were removed & replaced with original gold strap-posts. One of THE most beautiful guitars I've owned. Asking price- US $600 with original hardshell case (list $999 without case) SOLD! The mystery is solved-- this highly-sought but puzzling guitar was made for Epiphone and by Univox at the Matsumoku factory, which at the time was the most sophisticated guitar-factory in the world. Very solid, well-made guitars! This model was introduced at the same time Gibson moved its Epiphone production to Japan. See the Gibson trussrod cover! Shiny cherry-red with chrome pickups and hardware-- great condition other than missing the tremolo bar & spring (easily replaced). Beautiful clear sound, great action! Bolt-on neck but don't let that fool you-- solid with nice slender action and feel. Asking Price- US $350 no case SOLD! Gorgeous guitar! First year for the new Royal Burgundy color. Great acoustic sound, or with the original Gibson P-90 pickup reading 6.97k. Comparable to the Gibson ES-125-T except slightly wider 16.375" wide body. This is a great guitar even for acoustic-playing. All original hardware & electronics, although it's missing the pickguard. The action is fine, but if the strings are set to ultra-low by adjusting the bridge too low, they start to hit above the 14th fret. This could be corrected by removing and reducing the height of the fretboard extension which goes over the body, although the guitar plays fine without any work. Asking price- US $850 no case; prices on this Gibson model are jumping almost 50% per year, like the comparable Gibson's (priced at 80% which will rise in Sep'2007, making this priced at about 60%) SOLD! I'm impressed with these Epiphone Dot's, they're about identical to the Sheraton's but with less fancy frills. This guitar sounds INCREDIBLE! I had to pull out a pickup to make sure they weren't Gibson's in it! The pickups are both Gibson-designed CH-57's and read 8.29k (neck) and 8.75k (bridge)- gutsy and bluesy. Near-mint, other than the "E" emblem which fell off the pickguard, but it's in the case and easily re-glued, by me or by you. Asking price- US $325 with original hardshell case SOLD! Nicely aged-yellow triple-binding looks really cool! I'm afraid it will lose its mojo-look if I do a full cleaning. Custom scallop-edging along the fretboard-trim edges between each fret (smoothed down uniformly- see photo). Factory coil-splitter toggle switch. 24 FRETS !!! My second one of this model. This one has some minor dings in the body but overall has the nicer newer look. Looks like possibly a small headstock/neck area repair but the luthier tells me he only did some cosmetic refinishing over wear, so I don't know. Asking price- US $300 no case or $375 w-cool original-model coffin-case SOLD! Like new! Gorgeous wood all around! Very chunky neck-through-body; huge tone and sustain! See the trussrod cover- "D.A.M. "- I believe this instrument may have been the model used for a music trade-show. Asking Price- US $325 with leather adjustable bass strap SOLD! The guitar is marked "second" for no reason anyone can seem to find! If you need better photos, let me know, I just haven't had time to get photos of a lot of my guitars lately. Asking price- US $900 (list price is $2,306 !!!) SOLD! Asking price- US $225 SOLD! Set-neck. Headstock repair, done professionally and solid as a rock on the rear, but left a break across the headstock-face (see photos). It's been solid for me for 2 years. 24 Frets! Cool chevron-inlays. Cool headstock badge imprint. Ebony fretboard (Blue Book says rosewood but this sure looks and plays like the better ebony). Steinberger KB tremolo, missing the tremolo-bar, easily replaced. Mahogany body and probably neck-- weighs a solid 8-3/4 pounds (4.0kg). Solid! Japan factory-made, most likely Samick. Asking price- US $175 no case or tremolo bar SOLD! I prefer the thinner necks so... I bought it, I tried it for 10 minutes, I'm selling it. It has the stock Epiphone Classic 57 PAF humbuckers that I personally think are pretty decent. Asking price- US $399 SOLD! Hardly used, almost no wear. Lots of fun to play! Feels as good as my Gibson SG's to play, but lighter-weight. Great sounding original Epiphone Gibson-designed pickups, probably HB-101 and HB-103 which are the same as some of the Seymour Duncan Design lower-end pickup models. Bright fun gutsy sound. Samick-made but I don't know which factory. Bolt-on maple neck with rosewood fretboard, laminated maple/alder body. Weight 6-3/4 pounds. Feels, looks and plays almost identical to my 1972 Gibson SG Special worth $750+. Asking price- US $150 SOLD! Great guitar, fantastic action-- much like the action on the highly-sought 1980's "Epiphone By Gibson" headstock-branded Sheraton's. Someone had put on white speed-band top-hat style knobs, they look cool. If you prefer, I can swap on a pair of Gibson copper-tone knobs, instead. The photos show upgraded Gold Grover Rotomatic Van Ghent tuners, which are still installed, and the price reflects them. But I've been hoping to swap them onto my Gibson ES-335 Showcase, and if you'd rather have these tuners, I'll drop the price $50, swap them for you and put a new pack of strings in the case for you. Or, if you want this with original Epiphone 1990's tuners, knobs and pickguard, I can do that for the same price. Nut width 1-12/16" or 44mm, just a slight bit wider than the Gibson 1-11/16" necks. Asking price- US $650 with Epiphone hardshell case in great condition SOLD! This is the first edition of the Korean Samick Sheraton's after Epiphone moved production from Matsumoku, with the "Epiphone by Gibson" inlaid headstock logo. Original pickguard and original knobs included. Adjustable Epiphone Grover-style tuners. Slightly sleeker neck than other Sheratons that I've owned. It's hard to even find any wear on the frets. Overall about 90% condition other than the usual metal hardware pitting. Asking price- US $525 with hardshell case or $475 without case SOLD! Really nice guitar. This is the first edition of the Korean Samick Sheraton's after Epiphone moved production from Matsumoku in Japan, with the "Epiphone by Gibson" inlaid headstock logo used in 1987-1988. This one has the very early Gibson-style thumbwheel-adjustable bridge (which I prefer) that was replaced shortly thereafter in other Sheratons with the screwdriver-adjustable bridge. Apparently made on March 2, 1987 when Samick first began making this model. All-original, including the non-"E" pickguard and control knobs (not shown in photos). Adjustable Epiphone Grover-style tuners. Overall about 90% condition other than the metal hardware pitting typical of these guitars, mostly on the bass-edge of the pickups. Asking price- US $525 with Epiphone hardshell case in great condition SOLD! Samick Korea-made model, much nicer than the later Sheraton II model, and highly sought. These are the models which have "Sheraton by Gibson" headstock inlays. Some say these are the ones actually made by Gibson in Memphis in 1988. I bought this recently, because of my love for the pre-1990 Sheraton's, but now it's time to settle down to a few select guitars. These "by Gibson" 1980's inlaid-models are the better Sheraton's, before the newer Sheraton II models were re-introduced in the mid-1990's. All-original factory parts. Weight 9-1/4 pounds (4.2kg). Sheraton's tend to have slightly flatter neck-rears than the Gibson 335's, and more of a wide neck-feel like the much-desired early 1960's Gibson ES-335 models. No issues to note. Originally owned by an old blues-player who passed away within a few years after buying this guitar. It sat in a closet until the family sold it last year. Asking price- US $700 with hardshell case SOLD! Asking price- US $400 w-case SOLD! Gibson humbucker pickups! Gold-covered Classic 57's, they list for $125 each by themselves. This guitar is like-mint condition, very solid-built and 9-3/4 pounds weight. I chose this over my Gibson Lucille ES-345 Ebony (sold). But it's time to whittle down my collection. Asking price- US $550 with Epiphone hardshell case SOLD! Spruce top, mahogany neck, body back and rims/sides. Rosewood 12/19 fret fingerboard. Nice classical guitar, slight neck curve but very playable, some repaired cracks on the body rear near the lower end. Has its share of scuffs, about 70% condition. Asking price- US $325 with chipboard case SOLD! Spruce top, mahogany neck, body back and rims/sides. Body 14-1/4" across. Scale 25-1/2 inch. Nice classical guitar, looks great, sounds great. Handcarved faux-bone or faux-ivory replacement nut that doesn't look like it was quite finished, a bit oversized but works. Could use a replacement nut if you're fussy. I have the original wood nut but the side of the 6th-string groove was broken off when I bought the guitar. Has some well-repaired cracking on the body top but none serious (definitely no vibrations etc). See photos for any other details. The serial number isn't found at all, but the #568xxx would put it just after where the 1966's end. Apparently there's some way to tell whether it's a 1966 or 1969 model by the headstock logo that I haven't figured out. I'm psyched about how this guitar turned out, I converted an ES-120T with their awkward ugly raised-pickguards to a more standard ES-125TD. Plays and sounds great. The bridge pickup is jacked-up in the air some, so you get much better sound (Gibson never did figure out a way to allow P-90 height adjustment). Gibson newer-model P-90's sound great. All new wiring and electronics, replacement tuners, original tailpiece and probably bridge. The nut was a replacement, slight overhang 1-2mm on each side but appears to be bone. Asking price- US $750 with original full-depth Gibson chipboard black case SOLD! It was in 90% condition, until Fedex Home/Ground "mis-handled it" when I had it shipped to me a few years ago, and they put a hairline crack up the right side. It's glued and sturdy but you can see it in the photos. It could use some minor cosmetic touch-up or maybe just a wipe of Old English Dark furniture polish. There's also some wear on the neck-rear but far less than just about any others of this vintage. Still, it's in great condition, including the 1951 P-90 pickup (7.05k), fantastic sound, lots of fun to play.! I'm not sure if it has Kluson replacement tuners or if they are just in such great condition that they're still the original's. Volume-pot is IRC 6150689. The volume and tone knobs seem slightly different in color -- maybe they've just aged differently, or one was swapped on, I don't know. Asking price- US $900 no case SOLD! This is one solid workhorse. I suspect that it's been dropped off cliffs and out of airplanes and still feels like a rock (!!!). I've owned it since 2003 and it's been kept in the living room, the entire time-- it's the one I grab when I want to play. The P-90 was sold soon after I bought it. Lots of dings, scratches, gouges, some missing body-trim, reglued body-seams, headstock reassembled long ago-- and I'd have no problem playing it live without a backup or even traveling with it without a case. The only achilles-heel-- there's a minor ding into the 3rd fret at the 2nd (B) string, and if the bridge is lowered for the best action, the string buzzes on the 4th fret if you play the 3rd fret on the 2nd string (confused?!?!). Anyway--- that is the ONLY reason I even consider selling this guitar. It plays and sounds FINE if the bridge is raised up just slightly to still-normal height. Asking price- US $250 giveaway price, no case SOLD! Full hollow-body. The neck is straight, slender .78" deep by 1-11/16" at top, great action. I stripped down the guitar to do a nice cleaning. It's still stripped until I get time to put it all back together. The neck heel has been reinforced with a screw, the hole filled and finished over (see "stripped" pics). A pro-luthier could replace with a wood dowel and refinish to near-invisible, if the cosmetics concern you. Some fretboard-overhang splitting probably from when the neck separated long ago- cosmetic but not structurally threatening. The guitar had a screwed-down tune-o-matic bridge, so there are three small holes hidden under the bridge. Currently has original P-90 pickup and all-original pots, wiring, Sprague capacitor, jack etc. I may pull the P-90 and replace with a Gibson P-100 pickup under the original P-90 dogear cover. I'm offering 3 versions depending on when you catch me. Asking price- US $1000 w/original P-90 SOLD! gave this guitar to the wife of a pastor in 1973 so she could learn to play for worship services. She never really got around to learning much, so it's pretty much been in the case since then. Asking Price- US $750 SOLD! I bought this recently from the original owner, who treated it like it was his baby. I couldn't believe what great condition this guitar is in when I got it! The body has no f-holes, just like the Gibson BB King ES-345-- great sound! You can feel the vibes even unplugged. Check out the unique headstock inlay! Asking price- US $1850 w-original Gibson case SOLD! Like-new, great condition, fantastic sound, lots of fun to play! All-original parts, I'm told by an expert, including the original Gibson P-90 pickup that sounds really gorgeous. About the size of a large ukulele, 13 inches wide, 1-3/4 inches deep, 36 inch guitar length; Neck scale 22-3/4". A few minor dings around the edges of the headstock, otherwise pretty close to mint condition. Gibson brown chipboard case is in modest condition but functional. Asking price- US $1000 with Gibson period-case SOLD! This is not the thinline ES-140-T 3/4 model. This guitar is 12-3/4" (32.4cm) wide, and 3-1/4" (8.25cm) deep. The thinline version is only 1-3/4" deep. Probably 90%+ condition. Original P-90 pickup, harness, controls, tall knobs. Replacement gold Schaller replacement tuners in great condition. No pickguard, I understand that the earliest models did not have pickguards although there are screw-holes where someone at one time had one attached which is no longer with the guitar. Very minor fretwear, in my opinion, only minor string impressions on 1st thru 5th that I can see. This guitar is from the model's intro-year of 1950! Asking price- US $1600 w/70's LP-style asian silver-trim case SOLD! Essentially the wider 17-inch version of the traditional ES-125. One guitar I thought I'd never sell but I'm realizing I do much better with "fretless wonders" and this one was apparently re-fretted, medium sized. Replacement newer Gibson trapeze tailpiece and end strap-pin. Original tall barrel knobs, control-pots, single-line Kluson nickel tuners, Original P-90 pickup, electronics, bridge etc. No pickguard. Neck seems very stable. Currently strung with flatwound 11's. Immense depth of sound and resonance-- really! Nut 1-11/16" width. Gorgeous body-rear flaming! Strap-pin which is shown in photos on the side of the neck is removed. String-Nut has been cracked and repaired seamlessly. Overall 80% condition on the structure, the few detractors being the playing-rash where the pickguard would be, finish wear on the back of the neck, and chips on the headstock. Priced at under 70%. Asking price- US $1000 no case SOLD! Someone must have dropped this fantastic guitar on its plug/jack side when it was plugged in, thus a rather large crater where the jack should be. A cover-plate would work, I measure 3" by about 4-6". They apparently used some sort of tape to hold in the jack, and also to hold down the bridge at some point, which left a residue. I got almost all of the tape residue off the body front using Goo-Gone,. but the wood grain seemed to rise a slight bit there where the bridge base would sit (check photo). There's still residue on the jack area as you can see. Aside from the jack hole area damage, the guitar is in pretty decent shape, maybe 70-80% on the original finish. There's a small repaired crack inside the cutaway coming out from the body-rear that appears to be very old. A few frets were rising but I tapped them down, although they probably should be glued in and will probably rise after shipping. Someone told me they think that the guitar was refretted with thin fret-wire at one time, although I hadn't noticed, they seemed original to me. The neck trim is gone. Great project for someone who wants a great historic fantastic-sounding Gibson jazzbox for a lot less expense. Great looking guitar other than the crater. Body trim is all nicely intact and original. No signs of neck or headstock repairs or re-sets that I can find. AS-IS project guitar. Asking price- US $1000 STRIPPED of parts (only the string-nut and body-trim remain) SOLD! All-original, "Second" on headstock for no apparent reason, no flaws noted unless it's the tiny thin brown-red mark on the upper body-rear. Great condition, other than very minor wear and some slight cracking on the sides, not sure if woodgrain or just finish (see photos 8301 & 8302). I'm the second owner of this guitar, formerly owned by a jazz guitarist; toggle-switch has some floppy feeling but works fine. Original Gibson Patent-Bracket-Stamped Humbuckers dated 1979; all original hardware. The case has a lot of wear thanks to Kinko's/Fedex, now missing lower-clasp, handle removed. Asking price- US $2100 with original Gibson hardshell case SOLD! This guitar has been kept stringed and used occasionally by me for over 5 years with no performance-problems. Great guitar! I've used it on a few of my cd-released songs. Neck heel repair into the cutaway, possibly a repaired crack on the bass-side bout, repainted headstock face, rear, neck, body rear. Clear-coat on the body front. I'm not sure if the original sunburst was modified at that time or not, but it is GORGEOUS. None of the hardware was original (except the P-90 and DON'T ASK ME about it!). I got so tired of people wanting to buy this, then me having to go over every single detail until we both finally got frustrated, that I finally decided HECK I'M DOING SOME MODDING! Well.... I never got it done. I added the proportionately-drilled holes for 2 additional volume/tone pot's and a jack, plus an upper-left-bout toggle. I never could make up my mind what pickups to use-- and that brings me to the point of totally stripping it, and offering it for YOU TO BE CREATIVE! Offered separately, I have a 1950's Gibson Les Paul / ES-225T wraparound tailpiece, the type used originally on this model. Asking price- US $800 SOLD! Rounded-fretboard, really interesting! At first it caught me off-guard but I really came to enjoy playing it (still do, hesitate to sell). At first I thought it was modified, but it may well be a custom-order from the Gibson factory. Back in the 1930's and 1940's a lot of string-players (violin, cello etc) were seeing the demand for guitarists and made the switch, but they would sometimes special-order a guitar with a rounded fretboard just like this one. If it wasn't custom-order, any modification was done many decades ago, very nice. Gibson 1955 tailpiece and bridge from a former ES-125; newer Kluson-style tuners, all ready to play acoustic, just add pickups and electronics. Made only 1940-42, discontinued due to WW-II, re-released later with revisions. The 1941 model had 4-1/8" pickups. The 2nd pickup-hole on this one was added later, and nicely done. Original nut, endstrap-pin, jack included-- that's all. Spruce body top, flamed-maple sides, carved maple rear, 2-piece maple neck. Rather well-worn rosewood fretboard with real mother of pearl inlays. The faded black "stinger" paint on the headstock rear was factory-original, frequently done on higher-end models. Asking price- US $1200 no case SOLD! FLAMED body! Near-perfect! Probably 90%+ condition. Gibson P-90 pickup with original dogear cover, lots of tone-options with the tone-control. All-original parts. Presently has a no-modifications-made set of newer tuners, but the original's are in the case and in fairly good shape (see photos). Difference between an ES-335 and an ES-330? Neck mounted 2 frets closer to body, single-coil pickups, and about 4 pounds less weight! Incredible bluesy-throaty sound! I love the sound, neck, action and lightweight dance-with-me feeling of these ES-330T's. Weighs only 5-3/4lb. Nut-width 1-11/16". The case included is a 1970's Gibson, not the gold 1960 Lifton shown in any photos (sorry! but I'd sell that case for $750). Asking price- US $3000 with 1970's Gibson hardshell case (add $200 for a 1960 Lifton that's been oversprayed in black) SOLD! I've owned this guitar for about 4 years and it's been one of my favorites-- I love the sound, neck, action and lightweight dance-with-me feeling! Difference between an ES-335 and an ES-330? Neck mounted 2 frets closer to body, single-coil pickups, and about 4 pounds weight! Incredible bluesy-throaty sound! I agonize to sell this guitar! But.... I've got to move out about 100 guitars, soon, unfortunately, so this one's listed for a short time as well. Asking price- US $3000 with original Gibson brown-lined hardshell case SOLD! Neck profile feels almost identical to my 1964 Gibson ES-335. I used this on a jam-session recording in December 2007, and absolutely loved playing it-- great neck action, lower frets, super sustain. The Artist model is the same no-f-hole triple-bound body as the BB King ES-345 and others, developed during this 1980-ish Kalamazoo period. But the sunbursts have figured-maple, gorgeous. I think the photos represent the color fairly well. Minor very minor wear. A small part of the gold patina on the headstock-crest is missing (and can be repaired with gold patina and a paintbrush). Neck rear has 2 small wear-spots that look a lot worse in the photos-- barely noticeable in person. Slight scuffing on the one closer toward the headstock. Slight impact-disturbance around the jack, maybe bumped with the plug in or something, hardly noticeable unless inspected, and no functional damage. Active electronics controlled using 3 mini-toggles; 3-way pickup toggle, 1 volume, 1 tone control which is usually left in the middle, for the Active-electronics. Original brass nut. Shiny original hardware! I bought this in 2006. I've played it about an hour. I thought it would be my new #1 dream-guitar, but the slightly higher frets aren't my preference (I'm a fretless-wonder freak). Bummer.... It came from a guitar store, it looks new, it smells new, it plays new. Love it! Incredible sound! I didn't think I liked Classic 57 pickups until this guitar. It sounds incredible-- all sorts of brights and subtle sounds at once. Gibson Classic 57's humbuckers, gorgeous flamed billowed-maple body, mahogany neck, beautiful fretboard wood. Carved contoured body top, amazing feel. There's no pickguard but I don't think it ever had one-- maybe because of the fantastic contoured body surface. Model ES-Dot says the label, but also known as ES-335-TD-AN Antique Natural. Made at Gibson's Nashville plant in 1997-- Antique Natural finish. A more rare and sought-out finish, this model even sells for $400 more than others, now (see Musicians Friend et al). Asking price- US $2250 with Gibson hardshell case SOLD! Body and neck ONLY Original finish. Solid 1-piece mahogany neck-- the difference in these pre-1969 necks is amazing, you can feel the vibration and sustain rather well. Plenty of mojo from previous revisions by former owners (including metal-guitarist Kurt James who used the guitar on a cd session). Holes filled where a battery trap-door was cut in the lower right bout rim (can actually be removed without much effort if you want to use a battery-unit, they used the original wood for the door); several control-knob holes nicely filled on the body-surface (see photos); wood blocking added under the bridge pickup cavity to provide more sustain and less feedback (see photo PICT0263.JPG). Nut width 1-9/16" (40mm) but the neck is chunky so it doesn't feel as "narrow" as many others in this era. It's been refretted, as evidenced by a few tiny chips into the rosewood fretboard. The guitar had almost all later-Gibson replacement parts when I bought it for a lot more than I'm asking, so I'm offering it as a neck-body only project for someone who's always wanted a true vintage Gibson 335 but can't afford the prices of collector-quality all-original vintage ones. Someone asked the question whether this could be a 1969. It's possible but I doubt it, after a lot of research and examination. The headstock-inlay is the carved Mother-of Pearl. The serial# is 8514xx. The neck is solid one-piece, rather than the 3-piece introduced in 1969. The cutaway-ears also seem 1966 and not 1969. I'll let you use your own expertise, it's probably better than mine. The price would be the same, however, regardless of year. There's also a "2" at the serial-number, as though it matters about some possible minor cosmetic defect 42 years later, or that some employee bought it at discount. I'm considering just re-installing some effects and battery and using the previously-filled holes for them. If you're interested I can deal on a great EQ system that I have. One-piece pre-1970 solid mahogany neck and gold-label -- the one you want! I bought this from the original owner. The guitar has never had, or been modified for, a stop-tailpiece. Original Gibson Patent-Label pickups with nice nickel covers. All-original everything, to my knowledge. Other than the rather large buckle-rash on the rear, and a few wear-spots on the neck-rear, the guitar shows its vintage mojo without major detractors or repairs. The frets have some string-wear as is common with these 40 year old guitars. Nut width 1-9/16" but an unusually deep and more chunky neck than most 335's made in this period, and it's actually a full fist-ful for me even at the 3rd-5th fret. This is one of the few rare experimental neck volutes (very-small) made in '68-'69 on a few ES-335's, according to Gibson. HUGE RESONANCE and sustain from this neck! This guitar finished construction in January 1970 so the pots are CTS 1377010. This limited run of guitars was constructed in 1968-69 according to 1968 modified specifications. They all have pre-1970 features like the orange Gibson label, one-piece neck and the unusual deep neck profile with the small experimental volute. Original Patent-Label pickups read N=7.66k and B=7.60k. Asking price- US $3250 with 1970 Gibson red-lined case SOLD! Gorgeous cherry red, with shiny original hardware! Various experts have argued that this is a 1965 or possibly early 1966 model, due to various factors (the cutaway bouts, etc). The f-holes are the wider cut (1969+), and the headstock angle seems more like a 14 than 17 degree (1966+). Headstock-logo seems pre-1968 style to my non-expert eyes. Original ABR-1 bridge with nylon saddles, not sure about the thumb-wheels. Gibson 1965-only control pots (part# CBA-811-1053). Nut width 1-9/16" as was standard for the mid-'65 to 1978 Gibson's. I bought this from the first or second owner who bought it around 1969-1970 and pampered it well, his only guitar. Original Gibson Patent-Label pickups (see photos). Sounding great. All-original bridge, pickguard, pickups, harness/pots, knobs, tuners. It originally had a trapeze-tailpiece and then a Bigsby at some point. Later revised to a stop-tailpiece long ago, probably 1969-1970. Looking really nice around 80%+ overall. Chip on the headstock lower-left corner by the nut (see photos) and a small one at top-right, otherwise only a few minor marks. The frets may have been replaced since they seem a little high for the period but I can't say for certain. One of the better or best condition 1960's 335 that I've ever seen. Amazing sustain. I'm tending to play wider necks, these days, so unfortunately this one is on the selling-block. 7-1/2 pounds weight. Asking price- US $3500 with original Gibson hardshell case (1970? brown-lined) SOLD! Asking price- US $1,400 SOLD! Great guitar, really lightweight at 8-1/4 pounds (3.7kg). I bought this last year from a famous guitarist who had played with John Mayall and others. I asked him to autograph it inside the right f-hole, since I didn't think I would ever sell it. But now I'm finding that the more narrow 1-9/16" necks are more difficult for me to play, at my age. I feel bad offering to sell this, I told Kal I'd probably keep it forever, because it has such great sustain, very lightweight compared to many other 335's and just a great guitarwith that "just right" feel. Unfortunately, my fingers can no longer do well on the 1-9/16" necks. Pretty much superb condition. One minor current modification that you can change, or you might like it. The model came with a factory-installed coil-splitter toggle during these late 1970's. He had them reverse the toggle wiring so the upper-right bout toggle is for the pickups, and the coil-split toggle is near the control-pot's. Easily reversed again. Pickups-- Gibson original factory humbuckers, black-coated on the rear like the Gibson Series 7 and Dirty Fingers but these are different-- reading N=7.97k and B=5.27k, very normal-range. Currently has black bell-knobs installed (they were missing in the photo, oops). The guitar came from the factory with a "2" stamped in the headstock rear, and as usual, no one can figure out why. The guitar has no apparent defects. I believe the guitar can be seen on the stage behind Kal, to the right-rear at times, during Ka'ls 2004 live-video on YouTube. Asking price- US $1900 with newer hardshell case SOLD! Nice condition, stamped "2" on rear, no paper label-- usually because an employee was buying it at discount. Pickups are 1980 Classic 57 humbucker (bridge) and a newer-model replacement Gibson 496 (ceramic). Asking price- US $1750 with original Gibson hardshell case SOLD! Gibson Classic 57's humbuckers, gorgeous flamed-effect blue, mahogany neck. Rare finish! Not currently offered, I believe. Asking price- US $2250 LIKE-NEW! with original Gibson brown leatherette hardshell case SOLD! Custom Shop decal on the rear, cool unusual Black-Trim, nice smooth EBONY fretboard with BLOCK-inlays. I just bought this recently but the blue is darker than I'd hoped for. Great condition, great guitar! Metal hardware seems to have more than its share of hazing for its age, odd angled scuffing on part of the bridge pickup-cover, almost like it was intentional (stage-performing?). Close to a Beale Street Blue color, although my Beale St Dot is highly flamed, so this guitar seems darker, I guess. Gibson Classic 57 nickel-covered humbuckers read 8.05k and 8.03k. All-original everything, from what I can tell. Weight 9lb, 4.1kg. Nut width 1-11/16" and a 24-3/4" scale. Asking price- US $2000 with original Gibson brown leatherette hardshell case SOLD! The case alone is worth $$$! Nice Gibson brass logo plate etc. Does NOT have the original pickups-- these are newer 496N ceramic and 498T Alnico-- but they sound better than the originals in it! There was some sort of award-plate jack-mount that was removed, only the small screw-holes remain, that's about the only flaw here. Asking price- US $1,500 w-vintage original case SOLD! Always wanted a 1960's one-piece mahogany neck Gibson 335? Add 6-string parts and you've got one for 1/3 the price. The headstock's just a little longer. Gorgeous Vintage Cherry finish. The overall guitar appears to be fantastic 90% condition, and the finish shines like-new. But someone had put on 6 Schaller tuners with wider collars which left imprints on the headstock front, and apparently sprayed a little paint on the headstock rear to cover their work -- darn. Other than that, a few minor nicks along the neck rear and some small ones on the body, barely noticeable..
Body/neck and original 12-string nut only, plus the original Lifton gold-lined case which has some wear on its edges, but the hinges & latches are fully functional. Jumbo medium-high frets installed about 9-10 years ago by the former owner, and look like-new. Nut width 1-9/16" (40mm). It's superb for blues etc. if you just put on 6 strings-- tuner and bridge-changes optional, it works great, either way. Asking price- STRIPPED body/neck/nut US$2000 with Lifton blue-lined case SOLD! Always wanted a 1960's one-piece mahogany neck Gibson 335 6-string? Add 6-string parts and you've got one for 1/3 the price. The headstock's just a little longer. Body/neck and original 12-string nut only, plus the original case (or possibly an early '70's I'm not sure). Headstock repair done professionally some time ago. Overall condition 80% or thereabouts. I sanded down the repair finish and saw nothing obvious, so I repainted that area-- maybe it just had a crack or something. Nut width 1-10/16" (41mm), a hair wider than the 1-9/16"335's of this era.. The case is in decent condition, the old and valuable Lifton gold-lined. Asking price- STRIPPED body/neck/nut US $1250 no case - or - US $1550 with Lifton gold-lined 1967 case SOLD! This guitar is gorgeous, and superb in structure-- about a 90% on the original finish. About the only minor flaw is a scuff into the finish below the left bridge area. The finish doesn't come out well in photos, unfortunately. This was the first year that Walnut finish was introduced. 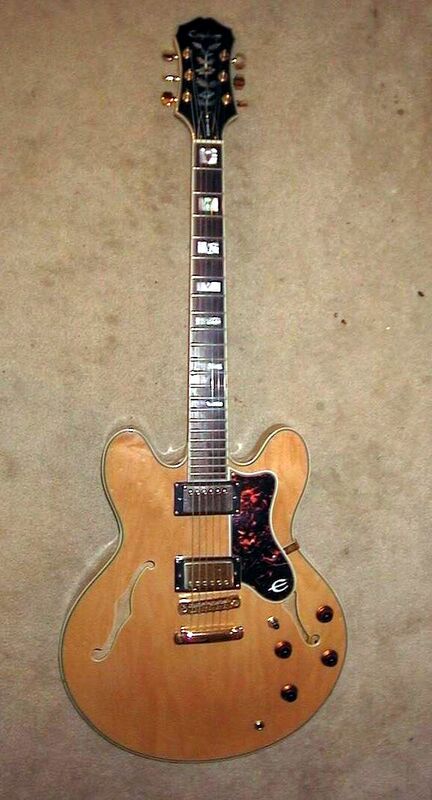 The economy is bad, people want vintage '60's 335's but can't afford them, and this one had all replacement parts. So, I have use for the parts, and figured I'd offer this one for a great project price. Body, neck and original nut, that's it-- you can supply whatever else you want. Minor wear, the guitar overall doesn't have any major detractors (check the photos, ask questions if you see anything I missed). It shows its age and use, but with minimal wear. 3-piece mahogany neck. Asking price- US $2,400 no case, or $2,500 with Gibson hardshell case 1970's SOLD! Decent guitar, great player, it's apparently been refinished, not sure if it was Ebony to begin with or possibly Natural, no telltale-signs. Fair repainting job although there's some chipping around the edges and a few specks of paint on the trim. For the price, though, what the heck. The specks come off with Goo-Gone and light scraping. Has the more desireable wider 1-11/16" neck at the string-nut. The model came with a factory-installed coil-splitter toggle during these late 1970's. The splitter-toggle knob is missing but in my experience the tall knob only gets in the way when playing (which is why they later moved it lower on the body). Pickups-- Gibson original factory humbuckers, black-coated on the rear like the Gibson Series 7 and Dirty Fingers but these are different-- reading N=5.25k and B=7.56k. I'd cleaned it up and left the strings off when I took the photos, you choose and I'll enclose a new pack of Ernie Ball nickel strings in either .009 .010 or .011 size. Asking price- US $1400 with no case SOLD! What can I say................. It's been around, original PAF pickups, stereo, Vibratone, you got it. The "psychedelic 60's" butterfly decal was removed and the finish was fairly well repaired. See the photos. Outstanding neck feel and action, the wider feel with the less-arched neck rear. Asking price- US $6000 with original Gibson case SOLD! Ready to play! Gibson Patent-Bracket humbuckers (7.23k & 7.11k), Varitone selector & stereo output rewired to mono but easily reversed. Weighs 9.0 pounds, nut width 1-9/16" (40mm) and 51mm at the 12th fret. Volute is only medium-height, not like some of the monsters of the early 1970's Gibson's. Has some fret wear (string indentations) if it bothers you. I didn't even notice them but I have to remember that some people freak-out about such things. Replacement tuners are Ibanez gold pearl-knob locking adjustables, very nice upgrades with the adjustable features. Weighs 9.0 pounds. Asking price- US$2,000 with original Gibson case SOLD! This had a neck repair and is VERY solid, it's been strung now for 2 years. It's got the Gibson Varitone inside, also two Classic 57 PAF-Reissue gold-cover pickups and all-gold hardware, TP-6 tailpiece. Everything's all-original on this. It sounds great, has super sustain even when it's not plugged in. Asking price- US $1000 SOLD! Not to be confused with the ES-345's, the 347's are basically upgraded 335's with similarities to the ES-355. The 347's have all-gold hardware, block inlays, lots of binding, gorgeous headstock inlay, brass nut, coil-tap mini-toggle. This was the first year for the ES-347's and it has a standard-sized toggle on the upper right horn, rather than the lower mini-toggle introduced the following year. Original Gibson Series 7 gold-cover pickups, much-sought by jazz guitarists who like the brighter yet mellow sound. These are NOT DirtyFingers pickups (which have 2 rows of 6-poles) -- totally different. Fairly decent condition for this period; Overall a very nice highly-shine finish. Lots of gold wear on the pickups & metal hardware, and a minor buckle-rash in the finish on the body-rear. Asking price- US $2350 with original Gibson hardshell case SOLD! Fairly decent condition for this period of Gibson's mediocre-paint finishes. Some finish wear on the side of the upper neck (see photos); finish blistering on the neck-heel; minor nicks & blemishes. Gibson gold hardware during this period tended to pit and wear easily. Original Gibson Series 7 Tim Shaw era neck pickup (14.48k); and a newer Classic 57 bridge pickup (8.14k). Weight is 9-1/2 pounds. Not to be confused with the ES-345's, the 347's are basically a blend of 335's and 355's. The 347's have the more-desireable 355-feature ebony fretboards, block-inlays, all-gold hardware, lots of binding, gorgeous headstock inlay, brass nut, plus a coil-tap mini-toggle for the neck pickup. This one came with the original TP-6 fine-tuning tailpiece but I replaced it with a regular gold stop-tailpiece in the photos. The TP-6 will be included but I'll have to remove the strings and I can put in a set of .009's or .010's or .011's for you to install with the TP-6. This guitar had been one of my primary players for a few years. I've had it in the case for a few months and pulled it out to find that the clear-coat finish on the lower neck and heel had started to crackle for no apparent reason (maybe a dry winter) -- no structural damage noted. See the last photo. But the guitar was still perfectly in-tune. Apparently a replacement Gibson truss cover, some or maybe all had the ES-347 on them but it's possible they just put a regular one on this-- hard to know on a 26 year old guitar! Weighs 9-1/2 pounds. Nut width 1-11/16"
Asking price- US $2000 with worn vintage Gibson hardshell case SOLD! Repaired cracks along the sides of the headstock/neck years ago, solid, could use some cosmetic touch-up if you want it to be invisible. The guitar was in the case 2-3 years without playing and was still in perfect tune when I pulled it out recently. This guitar is one of the more rare "Variant 3" ES-350's that originally came with two P-90 pickups, the model later became the Tal Farlow Model with fancier appointments. Original control-pots (19-9051). Replacement Gibson gold hardware, ebony bridge, WD pickguard & bracket. Schaller humbuckers (didn't know they made pickups!). They sound great! I was surprised. I'd planned to keep this guitar and do a lot with it-- add Patent-Labels, older hardware, Gibson L-5 tailpiece etc. but I'm no longer getting extensive guitar-project time. I was told that the control-knobs were original but I'm not sure-- they don't seem to have enough height. Weight 6-3/4 pounds (lightweight!). Neck scale 25-1/2". Original hardshell case is a bit worn and one edge partially separated but easily reglued. Asking price- US $3000 with worn original Gibson blue-lined black hardshell case SOLD! SUPERB condition-- 95% maybe. I was stunned when I bought this guitar. It instantly became of my top-3 favorite guitars. But I've only played it at home, and very little. It's honestly in TOO GOOD condition for me to feel comfortable keeping. Currently partially mono-wired but easily returned to Stereo. The Stereo-wires to the jack are simply connected together. For a true "mono" the pickup wires should be disconnected from the VariTone and reconnected to the toggle, instead. All-original everything, I think. It does have Grover gold tuners, but Gibson was putting them on some of their higher-end models at that time. Pickups are the original Gibson Patent-Label gold-covered, N=7.47k and B=7.04k. The 355's are basically an ES-335-TDC, but with impressive large-block inlays and the fancy Custom headstock inlay. Ebony fretboard-- one advantage over any ES-335, very smooth playing and a lot more resinency and sustain. Top of the line 335-style model for Gibson. Neck shape is the slightly thinner-taper style, nut width 1-9/16" (40mm) but not broomstick-rounded on the back like many were, in this '66-70+ period. I don't like the broomstick-shaped necks. I love this neck. This guitar was purchased from the guitarist for a very famous blues-singer icon. The band frequently jammed with whatever other famous guitarists were at their shows, as well, and has been played by numerous other famous guitarists, I'm sure, during the 6 months he was using it for concerts. Premier Guitar just used one of my photos of this guitar in its May 2008 issue, page 80. Asking price- US $8,500 with Gibson LIFTON yellow-lined hardshell case in great condition (worth about $750+ alone) SOLD! Rare Mono-wiring version, unlike the many Stereo, and rare stop-tailpiece unlike the many with Vibrola-tremolos. Pickups are Gibson Patent-Label T-top neck, and an early-model Seymour Duncan 59N, both sound great-- no covers, although that was actually a model-option. Basically an ES-335-TDC but with large-block inlays and the fancy Custom headstock inlay. Ebony fretboard-- one advantage over any ES-335, very smooth playing and a lot more resinency and sustain. Fairly decent condition, some neck-finish wear (see photos), minor nicks & blemishes. Finish-crackling on neck-rear, some wear on the lower left f-hole. Overall a very nice guitar. Neck shape is the slightly thinner-taper style, probably 1-9/16" but I haven't measured it. My notes say it came with replacement bridge & tailpiece but I'd have to check on that, and if so, what brand etc. Asking price- US $4,000 with Gibson 1970's hardshell case SOLD! Gorgeous cherry-red 60's Gibson in good to excellent overall condition and appearance. Typical modest finish-checking. Stop-tailpiece mount studs previously installed as an option by a former owner. Originally had a factory-installed Vibrola tremolo, replaced by a newer model gold Bigsby. Modest luthier-repaired headstock crack done many years ago (see pics), solid, doesn't seem to have gone very deep, mostly surface. Neck heel appears to have possibly been removed & reglued, not sure if that had to do with the neck-repair or what, but it's solid. A few minor dings on the neck-rear, but very little neck-wear overall. Typical vintage crazing over the body surface. Frets look original, the binding-nubs are still there. Gibson Patent-Label pre-T-top nickel-post pickups swapped in from a 1968 SG with newer gold Gibson covers. Very bright and chimey. Currently mono-wired with the VariTone bypassed, but easily returned to VariTone/Stereo (original parts and Henry choke-coil are included). Original ABR-patent# gold wired bridge, original Grover gold waffle-tuners. Sold to me as a 1966 by an eBay seller, but the f-holes are the wider cut (1969+) and the headstock angle seems more like a 14 than 17 degree (1966+). Headstock-logo seems pre-1968 style to my non-expert eyes. The serial # matches 1969 though-- 536xxx. I'm selling it as a 1969. The 355 model is basically an upgraded ES-335-TDC, but with Ebony fretboard, impressive large-block inlays and the fancy Custom headstock inlay. Ebony fretboards are very smooth playing and give a lot more resinency and sustain. Top of the line 335-style model for Gibson. Nut width 1-9/16" (40mm) but not broomstick-rounded on the back like many were, in this '66-70+ period. The control-pots are CTS type quality but Gibson-ordered, gold shafts, and stamped on the side, CVA-811-1053 500K and carried in Gibson 1960's parts-catalogs. I have a mediocre-playing soundclip of this guitar in MP3 format if you want me to email it to you. The Vibrola tremolo shown in photos is NOT included. The chrome tailpiece and studs shown in one photo are NOT included. Asking price- US $3,000 with Gibson 1970's worn hardshell case SOLD! Gibson's attempt to break into the new student-model line, similar to Fender Bronco; made by Gibson in Kalamazoo. 1 original 1965 Gibson Melody Maker single-coil pickup. Tremolo & mount removed; Kalamazoo wrap-around bridge/tailpiece. Pickguard has some warping (see pics), and a few cracks around jack on pickguard-coverplate. Case is in good condition, not sure if original to the guitar or not, but most likely-- it's the kind Gibson used on the Kalamazoo's..
Fun to play! Chunky truss-adjustable Fender-style bolt-on neck, Gibson Melody Maker sound. Asking price- US $175 w-original chipboard case (pickup/electronics, tailpiece & tuner-strip probably worth more, separately) SOLD! 2 original 1965 Gibson Melody Maker single-coil pickups; newer replacement-tuner-strip. Tremolo mount is still there, but not the trem; Kalamazoo wrap-around bridge/tailpiece; missing truss-cover. Case is in good condition but somewhat warped around the lower rim (see photos). Asking price- US $250 w-original Gibson chipboard case SOLD! Fantastic guitar, a true piece of history. This is one of the arched-top models, not flat-top, and the body rear is arched as well. Nice chunky but very playable rounded V-neck, a few frets are starting to come up on the edge and although they're playable, the guitar will do even better with them glued back down. Spruce top, mahogany rims & rear; rosewood fretboard. Replacement but still vintage Gibson tailpiece (probably from 1940's-50's? ), not sure on any other parts but the bridge and pickguard appear to be original. Blues legend Robert Johnson played a similar 1928 L-1 guitar. Asking price- US $1500 with original particleboard case SOLD! Asking price- US $475 with original Gibson hardshell case SOLD! Decent player-condition. It had a well-done minor headstock repair on the treble-side years ago. Modestly high action, adustable truss-rod. Replacement new AllParts strip-tuners. The string-pins in the tailpiece/bridge are black (photos show white), I somehow must have swapped the wrong ones on from another Gibson LG-x guitar during a mass string-changing fest or something. At one point there was a Gibson 60's trapeze tailpiece on here, so there are the 3 tiny holes in the body end. Asking price- US $275 with chipboard case SOLD! Gibson MasterTone Lap-Steel MEHG 1941-with original Gibson case!!! Great condition. All-original, including case. 22-1/2" scale fretboard with a 2-1/16" nut. Bakelite finish body and neck-rear. Original but rather crumbling-knob 3-strip tuners. Original and very rare-expensive bakelite octagonal knobs. Original Gibson P-13 (P-125?) pickup, successor to the famed Charlie Christian pickup, and better than its successor P-90 in the opinion of many players (including myself!). Wiring seems a bit noisy right now, haven't checked it, may strip it and sell or use parts if this doesn't sell soon. The parts alone are worth far more than I'm asking for the entire package! Asking price- US $450 with original worn Gibson chipboard case (price based on the value of the 1941 original hardware) SOLD! This guitar has been my primary Les Paul for the past 4-1/2 years. Weighs in at 9-1/2 pounds. Formerly cherry finish, the rear was not totally refinished in order to leave a small portion of the original finish on the upper neck volute (see pics). The finish is somewhat thin but solid, yet an easy sand-down to convert to Black Beauty or your choice. Ebony fretboard! Pickups Gibson Patent-Label's (!!! ), nickel-covers, one is a rare valuable "Gibson" logo from 1971, they sound gorgeous, gutsy and lively in this guitar. Original gold bridge, tailpiece, Grover Pat Pend tuners (yes Gibson used them on some models), back-plates and toggle-switch. Possibly the knobs-- one has a crack but intact, and the new rubbery clones don't crack. Control pots are replacements if I recall, it's been a while since I had the back-plate off. Headstock repair pro-done at some point, very sturdy, heavily covered in acrylic. A good repair = won't have to worry if it will break (like many do!). I'd totally forgotten about any repairs until I read my notes to create this listing. The photos closer to the top of the page are the more recent ones. Lower photos show the guitar before I reassembled the hardware etc. OR $1700 as-shown, no case, or $1850 with Gibson Les Paul early 1970's hardshell case SOLD! Gorgeous honey-blonde sort of finish done professionally years ago, took me 6 months to realize that the top (only?) was refinished. I believe this was originally a natural or honeyburst top, which someone possibly painted to black-top (hints in pickup cavities), and then back to honey-blonde-- very well-done. The finish really is gorgeous, a very nice honey-brown, the photos don't do it justice! I need to take better ones. The headstock mother-of-pearl inlay is also a gorgeous translucent bright-gold. Great condition, no structural repairs on it, etc. that I can find. Nice neck, great action, closer to a '59 neck style, not a '60 style, somewhere in-between. Solid guitar with some good weight (10 pounds) and therefore sustain. Not sure how original the hardware is-- probably replacement, definitely aftermarket tuners & bridge. Pickups are modern Gibson 490R and 498T, I've set them up for SUPERB sound, very close to a PAF-sound in my opinion. Maybe it's the original capacitors helping. Asking price- US $2000 with original Gibson violet-lined case SOLD! Asking price- US $1,100 with original case SOLD! All-original, bought in 2007 from the original owner! Stamped "2" under the serial number, either some miniscule defect or a guitar sold to a factory worker. Weighs in at 11 pounds, too heavy for my aging back these days unfortunately. Nut width 1-11/16" (42mm). Asking price- US $2500 with original Gibson LP case (with original key!) SOLD! Triple-pickup! Original two Gibson Patent-Label Mini-Humbuckers with a third Gibson Patent-Label mini added (cost me $125). There's some debate as to what is "going on" with the neck/headstock area. After careful and lengthy inspection, I decided it was finish-damage due to someone's glue dripping around the back of the neck when they re-glued down the nut. I don't see any actual structural damage. But the only way to tell would be to sand it all down. I've never had any problems or any signs of a less than stable solid headstock, though. Check the photos for your own opinion. As far as hardware-- those neck and bridge pickup rings were only used in 1971. Replacement tuners, control-knobs, and possibly jack-plate. Mini-toggle hole exists between volume-pots but I believe I removed the switch. Weight 10-1/4 pounds. Neck width at nut=44mm, and 12th-fret=52mm. Front-to-rear dimension is 24.5mm at the nut. Asking price- US $1250 $1,000 with original Gibson case (lock and some hinges broken) SOLD! GORGEOUS!!! The body finish is incredible-- birdseye maple glowing through generous bright-yellow to bright-red sunburst! I'm the second owner of this guitar. Other than a headstock-crack with fixable cosmetic issues, the guitar finish is in about 90% quality. Slight neck-at-headstock cracking (not broken) was reinforced but the finishing was amateur. Mother of Pearl inlays on this guitar are superb! Side by side with my other Deluxe's, this is the hands-down Beauty Star. Difference between 1970's LP Deluxe and LP Standard? Only the pickup types (humbucker vs mini). Cherry-sunburst Standard's are rare. Route this for humbuckers and you'll have one! Check the newest photos at the bottom of the photos-page for how it is in its current original-pickup condition. Asking price- US $1250 no case SOLD! The ORIGINAL gold finish is in much better condition than most other vintage original-finish LP's that you can find, any more. The dual mini-humbucker pickups are set up for superb sound-- very thick and throaty on the neck, very gutsy and bright on the bridge. The guitar is in great condition, very little wear compared to other Gibson LP's in this vintage. Asking price- US $2250 with original hardshell case SOLD! Asking price- US $625 SOLD! Better condition than many older LP's that have neck-wear etc. Moderate wear given its age- a scrape on the body to the left of the bridge, and some mild aberration on the headstock. Presently has a new chrome ABR bridge. Asking price- US $1,100 w-original hardshell case SOLD! Asking price- w-newer non-Gibson hardshell case - $1300 SOLD! Used by Rob in several recordings, otherwise stored away. Asking Price- US $550 SOLD! Great guitar, superb sound. The previous (original) owner either bought this damaged or had the headstock somehow damaged. It was repaired but never cosmetically finished. It's solid as a rock, at least for me, and I've had it over 4 years and kept it tune (it's stayed in tune), just sitting out in a traffic-way through my studio area all the time. Other than the repair, the fretboard has hardly any wear. There's a small ding at the top edge of the fretboard up against the nut (from the damage, I suppose) which isn't even in the playing-range. One ding midway down the front of the lower body. If it doesn't sell shortly, I'll probably use the sweet-sounding Gibson P-100 pickups and like-new hardware on another project around here. Asking price- US $450 with Gibson TKO gigbag SOLD! The Studio Standard's had bound body and neck! Dot-inlay markers. This one's in great condition, other than the usual surface-dings on the rear body. Original pickups, new bridge, tuners, tailpiece, new frets done by a well-known luthier. This guitar is about 2-3 pounds lighter than most Les Paul's. Asking price- US $850 SOLD! Great condition, hard to show finish in photos; near-mint with some hardware tarnishing on the gold, as typical, one scratch on rear (see photos). Guitar Center California ordered a limited-run of 200 (as shown on the truss-plate) and this is one. Jumbo Frets-- I really love this guitar but I'm finding that jumbo-frets are not my style, and so I sadly list this to sell. The pickups are Gibson 490 and 498 and they sound great, the way I set them up. You're thinking "Les Paul Studio- oh...." No way! This is one gorgeous guitar with a to-die-for look, sound and action! "Studio" just means "no binding trim." Doesn't need it with the natural-wood. The finish is hard to show in photos because of the incredible flaming-- it's sort of a dark caramel color-- looks like a natural-wood dark-goldtop of sorts. Asking price- US $1100 with the original Gibson hard-plastic flight-case apparently used for this model/edition SOLD! Price as a PROJECT GUITAR-- BODY & PICKGUARD ONLY- $325 SOLD! One 7-pound SOLID SLAB OF MAHOGANY body, it's either an original Gibson or else the lawsuit-clone Ibanez. Either way, it's solid Gibson-quality. The necks were custom-made by a California luthier for this guitar, who later went out of business and sold this kit. It needs fretboards and frets for both necks. Blue Book of Electric Guitars - "The Ibanez Double Axe model was available from (circa) 1974-76. The Double Axe was Ibanez� take on the Gibson EDS-1275." Condition-- general scratches and dings but nothing major of note. Asking price as a PROJECT GUITAR-- BODY & NECKS ONLY - $325 SOLD! Unknown Japanese SG-style guitar, possibly Univox or something, but with actual "Gibson" headstock logo decal. Real Mother-of-Pearl Fretboard inlays, it appears? They were common on a lot of the lawsuit-era Japanese-built guitars. Fun to play! Looks like "the real thing," too! Superb condition, probably 90% with shiny hardware. A very small (3mm?) repaired paint chip on the rear neck-volute, almost impossible to show in the photos. The top-right corner edge of the headstock has some minor wear, could be easily repaired but I don't want to ruin its originality if someone is a collector (I'd find a matching automotive touch-up paint for the job). All original hardware. The mini-humbuckers sound great (N=7.47k, B=7.51k). The neck shape is much like a Gibson '59 LP profile, unlike many of the typical asian LP's of this period which were narrower or less-deep. Frets are in great condition. Very comparable in structure, sound and quality to the various Gibson LP Deluxe models from the 1970's that I own or have owned. 8-3/4 pounds weight. Asking price- US $575 with original hardshell case in like-new condition SOLD! I bought this from a woman who said that her father bought it for her, brand-new, in 1961. There's some sort of small hole repair in the neck-heel, looks like the strap-pin had been mounted there at one time. All-original parts, I'm told. The chrome hardware is very nice and shiny. I bought it with the thought of using it regularly, but I would want to modify it with a 2nd pickup, and I hesitate to destroy its originality. Sounds fantastic and ooh-soo-Rockabilly with that original HiLoTron pickup! I just used it on a track for one of my new songs. Asking price- US $1500 with original Gretsch hardshell case SOLD! Thinline-archtop electric, 16" body width, great sound-depth, better than any Gibson thinline that I've played. Gretsch's answer to Gibson ES-125T and the more similar ES-350T; comparable to Gibson in construction and sound quality-- maybe even more sound-resonance than the comparable Gibson's. Original finish. Lots of wear on the fretboard, big ruts 1st through 5th fretboard areas, could be wood-filled. Some of the dot-markers are worn down or sunk-in, one is missing. I did buy a replacement dot-marker, and if I can find it I'll include it. Body trim appears to be replacement, well-done. Could be original and sanded/cleaned because it seems like a perfect fit. Currently as-shown except the pickup is a newer GFS Dearmond style that sounds great and has more guts and volume than the original Dearmond Goldentone's. I'm also offering this guitar totally stripped of hardware, only the body, neck and string-nut if you want a project. Asking price- US $750 no case, or stripped of parts US $550 no case SOLD! Thinline-archtop electric, 16" body width, great sound-depth. Great condition. Possible neck re-set, or else a former strap-button hole repair. Original Gretsch HiLoTron pickup & electronics. Gretsch's answer to Gibson ES-350T; comparable to Gibson in construction and sound quality-- maybe even more sound-resonance than the comparable Gibson's. Asking price- US $800 no case SOLD! Guitar body and neck are Gretsch-factory surplus which were assembled and fitted by someone, more recently. The body is 2-1/2" thick (rather than the 2"-thick 1960's bodies), and the neck was shaped rather chunky, for larger hands. This would be a fun project for someone who wants a stocky hefty Gretsch CG! Just add hardware, or redesign to your own tastes. This guitar is like-new, I bought it from the original owner, paperwork included. These are great guitars! I use my other one regularly-- even sometimes when the sound calls for "Gibson"- or get that classic Gretsch crunch! Very versatile, incredible sound, zero noise or hum on a digital studio deck. Smooth to play, the smaller neck is really comfortable yet not overly small, like with some 3/4 or Junior guitars. Asking price- US $1250 with original Gretsch case (guitar needed a wipe-down before the pics but I forgot!) SOLD! Asking price- US $2,750 with case & autographed certificate SOLD! Excellent condition; mute assembly removed (except toggle); new wiring but appears to have original pickups, pots, switches etc. Not as wide as the Country Gentleman body, same sound, nice hollow-body resonance. Original body-rear pancake cover included and in nice condition. Original bridge included but not shown (metal saddle w-rosewood base). Asking price- US $2000 w/original Gretsch silver-tray-tweed hardshell case SOLD! Great guitar! Gorgeous design-- check out the photos. All-original everything except the control-pots conversion. 17-inch wide body, about 3 inches deep, thinner than a jazzbox and thicker than a 335-style. Great neck. Wide yet not very deep neck profile. I prefer the feel over most Gibson jazz necks. Unique Burns truss-gearbox design. Great action, sound, you name it. Original Gretsch Filtertron humbucker pickups (zero-noise). There's a debate on its color, whether it was one of a rare few which received a "bad batch of paint," as Gretsch puts it (wrong color mix!). I actually talked with Gretsch saint Duke Kramer a year before he died (great guy! ), who chuckled about that batch and thought this guitar might be one of them. The vintage Gretsch hardshell case was purchased separately, but identical to my 1974 Super-Chet's case. The original flat mini controls were converted to CTS-style mini-pot's but I still haven't installed knobs. I still have the original flat control-pots and flat knobs (included) and I'd bought similar replacements but I'd have to find them and will include them IF I can find them. Asking price- US $1400 with vintage Gretsch hardshell case SOLD! Check out the fantastic headstock and jumbo fretboard-block inlays! This was an acoustic Synchromatic which someone modified into an Electromatic by adding a pickup hole. Asking price- US $250 no case (2006 book-value $650-775 in average condition) SOLD! RARE early version of this model. Identical to the sole electric guitar used by James Hetfield in the studio on the "Metallica" cd, and one currently used by Kate Voegele. NOT the newer-model with tone-mud toggle-- this has a REAL tone-control pot knob, like James Hetfield's and Kate Voegele's. MINT or close to it-- I mean it-- bought from the original owner (paperwork included), absolutely gorgeous condition. The only sort-of mod-- the original owner installed Grover Imperial (Van Ghent stairstep) gold tuners, without any extra screw-holes or modifications to the guitar structure, but also included the original's which are now re-installed (not shown in photos). True hollowbody, not semi-hollow! Like a 335 but better-- sleek thin neck although a slightly wider feel than usual, as a result although it's still the standard 1-11/16" nut width. Outstanding guitar, show-room condition, only two tiny marks on body lower-rear near jack-pin. 14-inch wide body, 24-1/2" neck scale, 1-11/16" nut. Asking price- US $1900 SOLD! All-original chrome hardware, great condition overall, a few paint-flakings on side & rear, around neck-heel (see photos). Original Guild Type II standard-sized humbucker pickups, nice for jazz, or you can replace them w/Gibson's. Brazilian rosewood 20-fret bound fretboard with pearl-block inlays, plays nice. Neck is slightly less-wide than the comparable Gibson ES-175-style- somewhat like a 1960 Gibson LP but not as small. Arched spruce top, maple sides & rear, mahogany neck w-rosewood fretboard (early models had maple neck). Asking price- US $1650 with nice original Guild hardshell case SOLD! Fun guitar, superb sounding pickups, coil-splitter push-pull tone control, Made in Asia under contract by Guild in the 1980's. Apparently rather rare, I've had tons of email inquiries and people asking about it. A few have said they had the same model but they seem very rare. EMG-style humbuckers reading N=9.82k and B=9.88k. 22-fret rosewood fretboard with chevron inlays. Center-block under bridge and tailpiece. Bound f-holes (many Gibson's don't even have that). 1 volume, 1 tone control. Black-plated hardware. The body near the neck-heel was cracked into the cutaways when I got it, very sturdy repair, I've had the guitar tuned and used occasionally for over 5 years now. Asking price- US $350 (what I paid for it in 2003) SOLD! What a delight to play, and it has incredibly beautiful sound from this small powerhouse. Apparently all-original parts; from what I've read, there were a lot of variations in this model, and this is one of them. Asking price- US $949 SOLD! Asking price- US $1250 $1000 SOLD! Appears to be all-original hardware except the adjustable-tension Grover tuners, and the brass nut which I recently added (original nut was toast). Original throaty Guild Type I humbucker pickups, great for rock & blues. A few fret ruts in the first few, wear here and there on others, might bother some players and not others (not me). Was clear-coated to protect the original finish by former owner. Body-trim possibly replaced on one part of the body, unsure. Fantastic neck action! Slender and not thick, "just right" for my hands. Best action of all the Starfire's I've played-- I'm just not playing this style much, now. Asking price- US $750 no case; or add another $450 (!!!) for the 1965 Lifton gold-lined 335-style original case SOLD! Gorgeous Mahogany grain. Was partially stripped of its finish by a friend who decided not to buy it when he discovered an old neck repair. The repair looks ugly because he stopped stripping off the black finish on the rear, but it's a solid repair. The guitar grain is fantastic and it should look superb once it's fully sanded and stripped to bare wood. I've had the guitar strung and playing for nearly 5 years and never really pampered it. There are 2 options-- body/neck structure only, or with whatever original hardware was on the guitar. Guild Lyre tailpiece-- the guitar says Starfire III on the label, but Guild had a way of randomly making II or III models that were the opposite (ie with or without Bigsby). Also the original Guild Type 1 covered humbucker pickups and I believe original control-pots et al but I'll have to check on the pots. The guitar is very very playable, despite all of the half-stripped finish-mess. I've had it strung and playing since I bought it until the friend wanted to strip off the black paint on the rear and also stripped the front of the guitar in the process. Frets have moderate wear. Asking price- US $450 body/neck/trim structure only, or $550 with the parts mentioned above; no case but packed very well SOLD! Appears to be all-original hardware (truss-cover was accidentally on my other '69 SF-IV during photos). Great player! Very similar to Gibson 335-style '60's-70's necks but slightly less-deep on the rear, and slightly wider and less awkward-tapered at the head. Guild Type 1 1960's original humbucker pickups-- throaty yet bright. Superb low action! Low fret profile. Straight neck. Weighs 8 pounds US. Some minor scuffing wear on lower body-front and rear, and around bridge; very little for similar guitars of this era. Asking price- US $1500 no case; add $100 for original Guild case which someone oddly lined with fluffy brown/white checkered flannel fabric SOLD! Appears to be all-original hardware-- apparently Guild used the Grover Pat. Pend. US tuners on this model at that time. Great player! Very similar to Gibson 335-style early '60's necks, less awkward-shaped neck than the same mid/late 60's Gibson's. Guild Type 1 1960's original gold-cover humbucker pickups-- throaty yet bright. Guild Bigsby tremolo (RARE- $500 on eBay!). Abalone block-V inlays-- nice. Guild logo 1966 hardshell case-- also worth a bundle on eBay! Superb low action! Low fret profile. Straight neck. Some belt-rash on body-rear, and misc wear (see pics). 3-piece neck has some minor gapping up the middle of the rear, still very stable even using the tremolo. Not uncommon for similar Guild's of this era. Asking price- US $2250 with original Guild case SOLD! Guild single-coil pickups, all-original hardware. I think the single-coil version was more rare than the humbucker-model. The headstock overlay is pulling loose and needs reglued. It either had binding-trim which is missing, or it has some shrinking, which occasionally happened with the material used for these. Asking price- US $1150 with original Guild hardshell case (Blue Book 2007 value $1750, I got a good deal when I bought it!) SOLD! Nice guitar! Lightweight, lots of fun to play. Appears to have all original parts except the vintage Fender knobs. Headstock-neck area repair done long ago and solid. I've owned the guitar for 6 years and it's been tuned the entire time. Great depth of sound, fully hollow-body. The finish was stripped when I bought it and I've never made up my mind whether to stain, paint or just clear-varnish, so I'll leave that for you to decide. The binding has the typical shrinkage of these old Guild's and other brands (see photos). This was one of the first guitar made of this model, introduced in 1959 and then offered in reconfiguration as the Starfire I, II and III series. Ultra-sleek neck, nut about 1-10/16" (41mm) to 49mm at the 12th fret. No hardware-- just the body, neck and trim (and some of the trim is loose). Decent shape and worthy of a little work, with the reward of a great player with a nice slender neck! Very little wear on the fretboard, although it needs a little cleaning (I'd use lemon-oil and a toothbrush). Binding is an issue on the lower body, also the bass-side waist, binding missing on the neck. Body needs some regluing on the lower-body rear. Some touchup repairs needed on the lower body. Very nice action on this guitar! I just don't need another project on my list. Neck without trim is 40mm at the nut and 49mm at the 12th fret. With trim, that puts it in the range of the desired 1-11/16" nut-width. Asking price- US $450 no case; totally stripped except for the apparently-original nut SOLD! Appears to be all-original hardware. Great player! A lot more standard-shaped neck than the odd broomstick ES-125 Gibson's of this era-- more like a Les Paul neck but with less rear-arch. The original Franz SD-1 (P-90-style) pickup is throaty yet bright, more diverse than Dearmond's or P-90's, a dark-Gretsch growl when toned-down. A few finish chips, small dent on side of neck near 3rd fret bass-side (see photos). Asking price- US $1075 w-later Guild hardshell case SOLD! Appears to be all-original hardware except the 1959 Bigsby removed from my '59 T-100. Color is a darker orange-sunburst. Great player! A lot more standard-feel neck than the odd broomstick ES-125 Gibson's of this era-- more like a Les Paul neck with less arch. Frets have little wear; the dual original Franz SD-1 pickup covers are shiny bright. They're throaty, too, and more diverse than Dearmond's or P-90's. The guitar overall has a lot of covered-over finish chips on the lower rims & body-back, primarily due to Guild's lower-quality factory finishing. I've toned them down, but repaired finish flaws are still there. Asking price- US $1050 no case, or $950 w/1959 Bigsby removed and original Guild tailpiece installed (70% Blue Book 2006 value) SOLD! Great guitar-- sounds great, feels great to play. Some chipping on the body, especially at the bottom, also around various joints (neck-heel etc, see photos) but the guitar is solid. I've owned it for 3 years and am offering it only because I need to clear out guitars for room, here. This model, introduced in 1961, is the thinner-depth 2-3/4" modified version of the earlier and full-depth X-50 Granada, which was a competitor of Gibson's ES-125. Gibson also had an ES-125-T thinbody. This Cordoba model is in-between depth, and I don't know of any Gibson comparable in body-depth. Replacement machined Gotoh tuners, really nice high-end Schaller-style ones. Otherwise it appears all-original. No pickguard. Franz original P-90 style pickup (readout 6.6k) with original chrome cover, they sound great, I actually prefer them over P-90's. Asking price- US $600 with original Guild chipboard case (brown w-red thread seams) SOLD! Original tuners, I believe, probably original gold harp tailpiece, original electronics & knobs I believe, original master-volume with the mini-control above the pickguard. Original Guild humbucker Type 2 (?) pickups. Ebony fretboard! An interesting internal modification on this guitar-- someone did quite a bit of work to put in a center-block tower of mahogany slabs under the bridge (the bridge-posts are mounted into the body), and ran a thick dowel of cedar-wood internally from the tailpiece-end up to the internal neck-block. It cuts down on the guitar's acoustical loudness but the intricate and elaborate sounds of the various woods vibrating differently is amazing! It's picked up by the pickups. Weight 10-1/4 pounds. The pickguard is a luthier-made custom replacement. I suppose the pickup surrounds are the same. Great neck, 1-11/16" at the nut, thinner profile (less-deep), sleek, great action. Body width 17" by 3-3/8" deep. It's shown in some photos with a Bigsby which was attached when I bought it-- far too heavy on this guitar! It's not included. Asking price- US $1150 with original Guild hardshell case (replacement-handle) TOTAL STEAL! Others currently selling at $1750-2500 SOLD! Better condition than most you'll find! Yes, THREE pickups, wow, and the famous Hagstrom "fastest guitar in the world" action. Asking Price- US $450 SOLD! A few body finish-cracks (see photos), a small crack from the neck-heel to the neck pickup with some separation in the wood. It was this way when I bought it, I've only played it a few times, kept it tuned and had no worsening of any problems. Asking Price- US $800 with original gold-lining particle-board case SOLD! A few minor body nicks, some wear across the bottom of the metal bridge. I'd had some intermittent issues with the toggle-switch, but cleaning seemed to help. Asking Price- US $450 with original gold-lining particle-board case SOLD! The ORIGINAL version of what modern Hagstrom-asia has reproduced and calls the Hagstrom Deluxe, altho the newer one is set-neck, and retails for more than I'm asking on this one! This model was designed by Jimmy D'Acquisto. It's a near-clone of the ultra-rare Guild Artist Award Mark VII 1967 (only 3 made in blonde), but with bolt-on neck. Expensive custom VanGhent tuners, fancy tailpiece with logo-badge. Tone-toggle switch on upper-left bout, gives both the Gretsch-muted sound and a coil-split higher-thin sound. Pickups-- original Hagstrom humbuckers reading N=7.98k and B=8.01k. Issues-- modest finish disturbance around tone-toggle (see photo); neck pickup-ring cracked (see photo); Tone switch occasionally crackly until spray-cleaned. Very lightweight guitar, great feel, fun to play, great action & sound. I used it on a few released recordings. I may decide to part-out this guitar if it doesn't sell, soon. Some of the parts are worth more than the guitar in total value. If you need one of the parts, let me know. Asking Price $650 with original blue-lined hardshell case (I paid $650 for it in 2002) SOLD! These aren't even made any longer, and they're very much in demand. This one is factory-custom-order, because of the third (middle) pickup, also the TV Yellow finish. Asking Price- US $1500 FACTORY-CUSTOM COLLECTIBLE! SOLD! I had many requests to buy this one, didn't want to sell it but I'm running out of space, so my loss is your gain. I bought this guitar brand-new, and was immediately inspired to write and record one now-released song with it. Total play-time on this guitar is probably 2 hours. RARE Aztec Gold finish (not even listed in Blue Book of Guitars)-- apparently a special 2001 run in this finish. It sounds incredibly sweet, very bright and yet throaty sounding Duncan-Designed '59 humbuckers. My opinion of the better set-neck Hamer's is very high. This guitar is very lightweight and yet well-constructed, great neck. Asking Price $325 no case, near-mint SOLD! Includes a brand-new vintage Harmony factory fretboard with frets! This guitar also needs the neck re-glued, the neck is loose but the body and neck seem structurally-sound. Asking Price- US $125 with the brand-new vintage Harmony-factory fretboard SOLD! Harmony H-78 cherry-red 1964 w-Bigsby UNDER-BED! Can you imagine... wow.. this guitar is nearly show-room condition! It was owned until recently by the original owner. Apparently all-original hardware. A few nicks & chips on body rear, top end of headstock; very little neck wear. Asking price- US $300 with original black chipboard case (has some tape-repairs on edges) SOLD! Great guitar, I've kept it in my living room guitar stand and a lot of people grab it to play. I used it for my daughter's wedding-rehearsal dinner. Lots of fun to play, great sound, typical chunky classic Harmony archtop. I believe the tuners, tailpiece and nut are original, not certain on the tailpiece, and the tuners are at least early 1960's or possibly 1940's-50's. Asking price- US $250 NO CASE SOLD! Gorgeous guitar, the hand-mosaic woodwork binding trim alone is amazing and worth a bundle. Traditional chunky Harmony neck but not nearly as chunky as some of them. All original hardware I believe. Any wear is evident in the photos, primarily the nut-end of the neck rear. Body 16-inch width. Bound spruce top, bound curly-maple sides & rear, bound spruce neck. I've had this guitar for almost 5 years and thought I would never sell it, but I'm rarely using it lately and I need to vastly reduce my collection. Asking price- US $550 with its original falling-apart (literally) brown case which can be repaired SOLD! Superb sound, classic example of a 60's Harmony-made Silvertone acoustic Spanish archtop. Adjustable truss-rod! Amazing feature usually not found on these models! I added a smaller Gibson-style trussplate which mostly covers the cavity (not shown in photos). Bound maple body front and rear. Typical chunky-neck of that era. In some lighting it appears as a beautiful honey-sunburst, and in other lighting a slight shade of cherry blends in where the sunburst edges merge. Came with a replacement (and better) tailpiece, the original was one of those staple-shaped styles and the holes are still in the body end (I have some of those old staple tailpieces if you'd prefer). I added vintage strap-buttons. It's also missing one tuner-collar. An anchor screw was placed into the neck heel by me when I thought I'd be keeping the guitar forever. Easily filled by a luthier if you're fussy. Also, see the scrapes on the bottom rim in the photos, and the nicks on the neck rear in photos that I've just added. VERY playable, a favorite for me to grab here at times. Asking price- US $250 SOLD! Body 15-1/2" wide, 2-3/4" deep. All-birch construction. There are several small holes where an electric Dearmond pickguard had been removed, and a rim-hole from the former jack. I still have the pickguard with electronics, jack & Dearmond "Hershey Bar" pickup intact. I'd planned to use it, or sell it (worth $$$ !!!) and I've loved playing this guitar without it. The sound is great, surprising for a thinner-archtop. I'm getting down to painful selling decisions, and this is one of them. The neck is slightly chunky but comfortable, not as rounded-deep as most Harmony's of this period. Nut width 1-3/4" 44mm. Excellent condition (see photos). An old-fashioned neck-heel screw for support, or maybe it was just put in where there was once a strap-pin screw, I'm not sure. If you want the guitar with the original tortoise pickguard/Dearmond/controls/jack etc, here are photos of it. I thought it was ugly, honestly. If you really want amplification, you might also prefer using a bridge-piezo pickup, or some other surface-mounted pickup and using the jack-hole. Or, add the original Dearmond pickguard assembly (see below). Asking price- US $300 with original brown-alligator chipboard case; add $150 if you want the original Dearmond pickguard assembly SOLD! Comparable in style AND quality to Gibson Les Paul "The Paul"
One solid chunk of wood here! Great neck action, too,.although it is a bolt-on neck. Harmony Silhouette H14-V w-tremolo, Dearmond pickup, original case, great condition! Asking price- US $275 SOLD! Asking price- US $200 SOLD! Gorgeous solid mahogany striped-grain body! See photos-- incredible. Solid feel to the wood structure, great sustain. Set neck 2-piece carved mahogany (not split-heel style). Carvin M-22 cream dual-pole humbuckers in both positions (replacing the TVJones' shown in the photos). Super condition; well-constructed guitar for a great price. Impressive quality. If you're comparing to the Epiphone Dot's etc, this is far superior in structure quality, in my opinion. Asking price- US $125 SOLD! Great fun to play, lightweight, superb sound from the Hohner HP G-4 Kent Armstrong dual-coil set-post cream humbuckers (N= 12.81k, B= 13.23k). Used by Rob in several to-be-released recordings. This is probably THE BEST condition copy of a Hohner HG430LP that I have ever seen. Original pickups & tuners, replacement bridge & tailpiece. Plays great! Neck is like the Gibson '60 thinner neck-style. Great action. Working truss-rod. Made by the same Arai factory as the famous lawsuit-Arai guitars; similar to Ibanez 2386 model. The body-front is gorgeous and in super condition. Has some minor wear on the guitar as shown in photos. Someone recently noted in one photo that there must be a thin crack on the body-front from left-tailpiece stud to the rim, but I'd never noticed it visually. After inspecting, it's there but appears to be just a hairline in the thick clearcoat finish and not in the wood. Several small hairline-style cracks running from the neck-pocket that don't appear to pose any threat to the integrity whatsoever, they're pretty typical for these old bolt-on LP's. Pancake body (2 slabs + middle layer), just like the 1970's Gibson LP's. Abalone headstock inlay, real Mother of Pearl fretboard inlays. Original Gotoh humbucker pickups which generally read around 9k. Original adjustable-tension tuners; newer replacement ABR-style bridge, tailpiece and control-knobs. Weight about 9lb (4.1kg). Asking price- US $400 with Hohner HG430LP hardshell case SOLD! Like-new, about 90% condition, hardly any wear on the guitar or frets. All shiny original hardware. Set-Neck like a Gibson, great action. Apears to have the original pickups, no markings on the rear but DiMarzio-style. They read N=12.88k and B=13.28k. I have 3 of these L-59's and at times I prefer them over my Gibson LP's. But I don't need 3 of them at this point! They were designed to conform to the Gibson 1959 LP's if I recall. This is the only one that I've seen with a serial number and it begins with 89, thus my assumption that it's a 1989 model. Asking price- US $375 w-gigbag SOLD! Hohner Les Paul DC Artist or Firebrand 335-S-style solidbody natural 1971? Matsumoku-factory 1970's built. Alembic-style. Solid Alder body; one-piece maple neck-thru-body (Rickenbacker-style), very chunky deep yet not-wide sleek neck, very solid-sustain. Schaller "Made in W Germany" adjustable tuners; ivory (or possibly bone) vintage replacement nut. Pickups- 70's-style chrome-covered humbuckers swapped back in, not sure if original or not (ignore zebra's shown in pics). This guitar was bought from the original owner, who purchased it around 1971 while stationed in the military in Germany. But he never learned to play. I've seen same or similar Matsumoku, Memphis and other guitars made for their usual name-brands but I've never seen one with the Hohner headstock and hardware. Asking price- US $450 no case (probably worth more, as a rare-prototype Hohner collectors-item) SOLD! Solid Alder; one-piece neck-thru-body (Rickenbacker-style), nice strat-style neck profile, 21 frets, very solid-sustain. Original humbuckers with dual 6-stud rows, all original hardware. Bought from the original owner who decided as a teen to black-paint the guitar's rear and headstock front, easily removed as I discovered when I lightly rubbed some steel-wool over the mother-of-pearl headstock logo inlays. I just haven't had time to remove the tuners and do the rest. RARE HOHNER-COLLECTOR'S ITEM!. It does seem similar to a style of solid neck-thru-body guitars which EKO Italy began to specialize in, during the 1970's and early 1980's. I've also recently seen at least one similar that was Matsumoku Japan 1970's (Aria, Epiphone et al). This guitar is near-identical to the Aria Pro II TriSound TS-600 which was also made by Matsumoku. Also similar or a clone of the Guild S-50 JetStar model. Asking price- US $225 with worn original chipboard case SOLD! The Revelation's were inventive guitars, pro-level $899 retail, 24-fret, extremely lightweight body, fast neck. Asking Price- US $400 SOLD! The Revelation's were inventive guitars, pro-level $899 retail, 24-fret, 1992-1993 only, the new models don't even compare. 24-fret, ultra-lightweight at around 7 pounds. This one is officially a "transparent honey" but many of these guitars had unique variations, and this has more of a pumpkin-hue. NO TREMOLO BAR INCLUDED - sorry! Shown in one photo but borrowed from another guitar. Easy to replace, threadless smooth-shaft. Asking price- US $250 without case, or US $325 with custom Revelation case (shown in RTX-Marble-Gray guitar photos, below) SOLD! This is the RTX model, which has dual/single 3-pickup single-coil configuration, as opposed to 3 single's. As is typical of the finishes on the candy-coat-colors of this model, this guitar has a spiral-shaped crack coiling around the left cutaway-bout, which seems stable. It doesn't connect along the coil, so it doesn't seem to be a threat for suddenly coming loose. Asking price- US $300 without case, or $US $375 with custom Revelation case (shown in photos) SOLD! Plays great! Super action, more comfortable than many of the Epiphone Dot copies, also lighter-weight. Stock pickups are Kent Armstrong Skye humbuckers. Hohner SG Lion Black Professional RARE! I don't know much about this guitar other than what you can see-- 24 frets (great! ), cool star fretboard inlays, S/S/H pickup configuration with EMG Select's, 1 vol & 1 tone control, 3 mini-toggles (2 for effects). Kahler locking tremolo and locking head-nut. Nice low frets for fast action. Asking price- US $250 with gigbag SOLD! Samick built, this model was offered from 1997-2000 and listed for $549. Kahler-licensed Floyd Rose whammy-tremolo, all "gold" hardware. Coil-splitting push-pull tone control. 24 fret neck! Weighs 8-1/2 pounds. One of my favorite models for doing the heavy-metal stuff! Hi-gloss GORGEOUS (spalted?) maple 1-piece fretboard/neck-- amazing grain pattern on the fretboard! Hohner USA says this model was a Germany-only release. Asking price- US $200 no case SOLD! Standard-sized strat-clone neck and pickups with Hohner's secret black-box "ATN-Active" passive-electronics (no battery needed!). I love the sound of their ATN black-box. Like-new. There's a patriotic story here. This guitar was purchased by a group of US Army soldiers stationed in the DMZ in South Korea, and they learned to play together on it. When one was injured in a parachuting-drop, he was given the guitar when he was sent home, but he never learned to play. He gave it to someone who helped transport him home, who then sold it to me. Asking price US $150 SOLD! Early hard-to-find white model with standard humbucker-style pickups, unlike the newer versions which have the thinner FilterTron/HiLoTron-clone pickups. Adjustable (hex-screws) metal nut; Bigsby-style tailpiece; ABR-style adjustable bridge on rosewood base, adjustable-tension Schaller-style tuners. Nice 2-3/8" semi-thin TRUE hollow-body, loads of sound depth! Even the stock Turser pickups are nice-sounding, so I didn't swap in Gibson's. Maple set-neck. Gorgeous MOP inlays. Very much the same quality as Epiphone's, Samick's et al. I've done a lot of fine-tuning tweaks on this guitar-- fine-tuning sharp fret edges (not uncommon with Turser's), smoothing the fretboard trim, making it play really comfortably. Gretsch gold control-knobs added, also a White Falcon-esque gold pickguard. I didn't think I'd ever sell this but I'm not using it much, these days. It's only been used in my studio for recording (it's on a few of my cd-released songs). I moved the upper strap-mount button, twice. Gretsch does the same thing at the factory, and simply puts gold screws in the holes. This doesn't have gold screws in the holes, but if I can find any that fit, I'll add them. Asking price- US $400 w/gigbag SOLD! Gibson humbuckers! Sound incredible and bring out the natural resonance-- 496R in neck and a 1985 Patent-Bracket in the bridge. Like-mint condition. Great action, plays much like my former Gibson ES-175D 1977. A pleasure to play! Probably two hours or less playing on this guitar. Set-neck. Fully-deep 3" fully hollow-body, has great deep resonating acoustic sound. Decent construction. I bought this guitar brand-new in 2004 to compare to Gibson ES-175's etc. I'd keep it if I didn't have so many other guitars-- very surprisingly good guitar. Asking price- US $350 w/current Gibson humbuckers (no case) SOLD! Very surprisingly-good quality guitar! Lightweight nice feel, great action just like a Gibson. Set-neck, great condition! Miniscule 2mm chip under 6th string between pickups (see photo), otherwise mint condition (bought it new). Asking price- US $150 with gigbag SOLD! Set-neck, like-new condition! Equal quality with Samick and Epiphone Les Paul's, in my opinion. Very surprisingly-good quality guitar! Great action, has a '59-neck feel, standard 1-11/16" nut width. The pickups sound great-- I'd planned to replace with Gibson's but decided not to, after playing this-- gutsy, bright, throaty. They read out at 8.73k neck, and 17.01k bridge! Gold-plated, just like the hardware. I really love the feel of playing this guitar-- great balance, neck, action, everything. Asking price- US $325 like-new condition, with gigbag; expect the value on this collectible-guitar to continue to increase SOLD! Set-neck, like-new condition! Equal quality in structure with Samick and Epiphone Les Paul's, in my opinion. Very surprisingly-good quality guitars! Very standard LP-style SET-neck and frets, not a bolt-on. Practically mint-condition, I bought it because it was so gorgeous but only put in an hour of playing to try it out. I'm going to sell either the JT-200 Red-Sunburst (above) or this one, whichever goes first. Asking price- US $250 like-new condition, no case; allegedly a rare finish SOLD! Very lightweight, has a nice neck and action, sounds very Tele, not cheap. I bought this factory-new, have hardly played it (2 hours?). Custom black-tortoise pickguard added by me. Asking price- US $125 no case SOLD! Set-neck, new condition! Equal quality with Samick and Epiphone Les Paul's, in my opinion. Very surprisingly-good quality guitar! Gold-plated pickups and hardware. Bought new from a guitar store to compare for quality, stored away after trying it out. Essentially the same Made in China guitar offered by companies like Jay Turser, Olympia, Galveston, and many others. Photos are rather off-color and over-bleached, camera didn't do too well! Gorgeous bright eggshell-white and shiny new gold hardware. Asking price- US $150 new condition SOLD! The best one of these I've ever seen. Jumbo 17-inch full-depth body. Serial# indicates Model 8900. Nearly straight neck even with heavy strings. Fantastic sound. Original tailpiece, not sure about bridge, near-new gold Gibson Deluxe Kluson tuners. In some lighting the finish actually looks like it has a cherry-sunburst hue. Block inlays! Mother of Pearl!! Rosewood fretboard. Minor wear spots a few places on sides of neck, one small odd rash on body rear, slight finish crack that seems finish-only and not into the wood unless it's from a raised wood grain. Some scuffing at base of neck on heel but I can't find any indication of previous bolting or nails or such. Asking price- US $450 with near-new nice TKL hardshell case, nice padded handle SOLD! Kay-made Del Oro guitars were made in the late 1930's at least for this model. Cool original deco Lucky-Horseshoes & Shamrocks painted design on this one. Chunky neck, noticeable warp but still decent action because the bridge-base was removed by a former owner. Sounds great. Apparently all-original parts, maybe 80% condition considering its age and student-level quality, modest wear for a 70-year old guitar. Asking price- US $150 no case SOLD! Totally stripped of hardware in this Project listing. Really nice guitar, with a slight neck-curve and no truss-rod. The neck heel has been screwed down but still has a modest gap and could use a neck reset. Spruce top, flamed maple back and sides (or mahogany sides? can't tell), not sure if the bound-neck is maple or mahogany through the finish. Original finish. Nice neck profile for an old Kay, it feels more like a 1959 Les Paul style neck to me. The original control pots were dated 1960 but it's got the appearance of a great old 1940's or 50's. 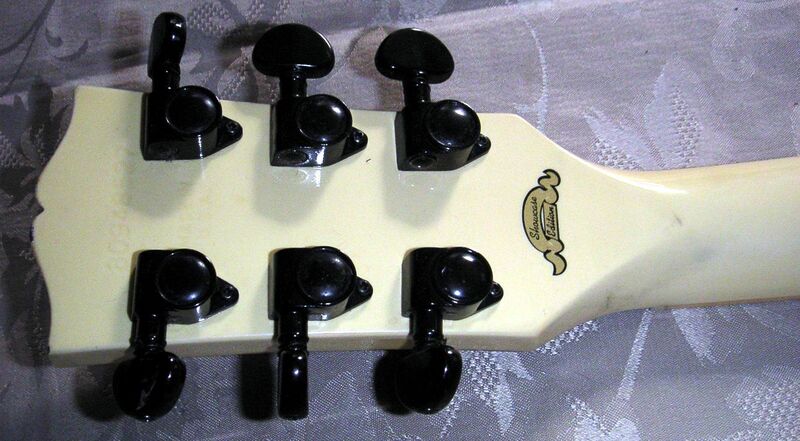 The triple-hump headstock was a fancier version used by Kay in the 1940's until late 1950's. Very solid. Great acoustic sound. Thinline body, 2-5/8 inch body width, great feel. Yes, somewhere I have a bag with some or all of the original parts but they're not included at this price. And I'd have to track them down and figure out a higher price that includes what's there, if you were interested. Old Kraftsman was a headstock-brand made by Kay for Spiegel Catalogs. Asking price- US $100 no case SOLD! Fantastic sound. 16-inch body width. Someone replaced the body-rear with flat plywood. Oh well. It sounds fantastic. A few repaired splits on body-front. Apparently varnished fretboard, as seemed common back then. Rather straight neck for a vintage Kay, barely a slight warp on the bass side. Nice thinner-profile neck, great action, very un-like most of these chunky-necked vintage Kay's. No nut (I think one's shown in photos but it isn't there now!). Add your own tuners, tailpiece and bridge, and you've got a great-sounding vintage archtop with an eccentric but cool-grain ply rear. No one will see the plywood while you're playing except for you! Probably mid 1950's or possibly later. Loads of deep resonance and depth of sound. Typical Kay modest neck arch but very mild and very playable. It has a steel-reinforced neck which is unusual on Kay's but far more common on 1950's-60's Harmony's, so I do have to wonder which company actually made the guitar since they occasionally swapped off. All-original hardware from what I can tell, cool old Kay foil headstock overlay, the parts alone are probably worth more than I'm asking for the guitar. Nice vintage Kay archtop, attractive tri-burst finish, 16-inch body width, detached set-neck. The neck fits right in and should be an easy glue-down. A few cracks on the body surface that appear to have been at least modestly repaired in the past. Needs tuners, bridge, string-nut, neck-trim and tailpiece. Great sound from the SOLID-spruce top, birdseye-maple sides & rear. Not sure on neck wood. All original hardware. I bought this from the original owner who bought it in 1945. He'd drilled a strap-hole into the headstock (not pretty) which I've filled but not cosmetically covered. Chunky-necked vintage Kay style. Plays and sounds great, and I hate to sell it but I'm beyond being out of room, here. Asking price- US $300 no case SOLD! Same identical guitar made by Kay and ordered with the Gretsch logo which became Gretsch's first name-branded guitar, the Gretsch Electric Spanish in 1939/1940. The Oahu logo-version was made by Kay and ordered by Oahu Publishing Co, a music-store and rebranded-instrument distributor. Extremely rare, one of the earliest electric guitars; ultra-deep 3-11/16th inch body(!!! ); solid chunky neck; slight curve (not uncommon on most guitars of this vintage) although I never noticed it when playing until I checked the neck before listing the guitar. Original hardware, huge Volu-Tone pickup and original electronics, except for replacement but still-vintage butterfly tuners (see photos). The original microphone-style jack is included, currently has a standard 1/4" jack on the endplate-- easily reversed. I've made an MP3 soundclip sample and can email it if you want. A very rare and valuable collector guitar and a piece of guitar history. The Volu-Tone pickup, one of the first-ever guitar pickups, is itself worth its own fortune to collectors. Asking price- US $1250 with original Kay tan chipboard case SOLD! Kent Les Paul Effects Model 1970's Lawsuit-era VERY RARE! Matsumoku factory? Near-identical in structure to the various Ibanez, Hohner and other bolt-on neck LP's of the 1970's. Heftier neck than the Hohner's, though. Great condition, maybe 90% other than the obvious neck-rear wear. The guitar gets some great and interesting sounds, plugged in with the 9V-powered effects modules. Fuzztone, Phase, Echo, Tremolo, Wah, Whirlwind in various combinations using the switches. Built-in preamp with a headphone jack! Much-sought original Matsumoku chrome-plated humbuckers. 1 volume, 1 tone, 1 effects speed-control. Nice action, the neck profile is much like a '59 Gibson LP and surprisingly comfortable "standard LP feel" to me. Wide low frets, very similar to the 70's Gibson LP's, with surprisingly little wear. I bought this on ebay about half a year ago and haven't had time to take my own photos, just in case someone recognizes the ones I've borrowed from the ebay listing (!!!). Asking price- US $650 with apparently original case SOLD! Klira 12-string acoustic folk-guitar German-made probably 1960's WOW! Rich full sound from the spruce body-top. Solid-oak neck with superb action! It's bolt-IN, see photos. Gold-inlaid headstock logo. Very unusual guitar! Check the pot-belly body-rear! It really projects the sound of this rare and unusual guitar. Klira was another popular German guitar-manufacturer in competition with Hofner and others. A flood left them bankrupt in 1982. What a chunky microphonic sound on these strange Zenon "Z" pickups! Very chunky boxy sound, fun to play. Hefty neck, very low frets but I got used to the feel and really have fun playing it. Rather lightweight body, classic mediocre red "finish" but ultra retro-60's look! Zen-On Pick model, a Canadian guitar manufacturer and importer of Japanese (Teisco/Guyatone/Kent/Tokyo Sound) rebranded guitars. A little binding missing here and there on the body. But find another one in better condition-- or try to find another one, period! Asking price- US $350 no case (this rarity could turn out to be worth a lot more-- potentially good investment aside from fun playing) SOLD! Fantastic high-contrast flamed-grain under thick but slightly-yellowed clear finish (would look incredible stripped! Probably bookend-maple cap over maple ply body. Small cracks at both sides of the neck-heel pocket on the body -- I'd never even notice but they're shown in the photos, and they've never caused me a problem. The guitar stays in tune without issues. Probably made by C Bruno Co in the past 2-3 decades. Memphis Les Paul SP-200 set-neck highly-collectible Les "The Paul" or LP-Junior clone classic! Possibly built by Tokai in the 1970's. Older Memphis set-neck models are in great demand for their outstanding quality. Apparently newer 1990's Memphis-branded guitars are also being made in order by distributor C Bruno of CT, so this could be one of those as well. 2 Bill Lawrence L-500-LTS Dual-Rails style humbucking pickups. One replacement-tuner (see photos). Triple Hi-Gain pickups, lots of fun! I believe I rewired the middle pickup to the ridiculous and useless mini-control to use as a separate volume. Great condition! Very little wear if any. I used this on a few recordings about 6 years ago but have hardly used it, since. Stocky neck, typical of the 330-series. The 340 is basically a 330 with an extra pickup. Asking Price- US $1200 w/original hardshell flight-case (aka bullet-proof!) SOLD! Bought from the original owner who hardly played it. Neither have I. I was too astounded at its near-mint condition when I got it! One nick just body-edge of the jack-mounts, that's about it. No other wear noted. I'll recheck once someone inquires. Asking price- US $1400 with original blue-lined hardshell case (Blue Book 2006 Value $1500 + case!) SOLD! Fantastic low action for this model. Asking Price- US $900 SOLD! About as mint as a played-6-times guitar can be! Custom color and black binding, gorgeous, sounds fantastic! All-original, with Ric Hi-Gain pickups. Practically in near-mint condition after all these years. Asking Price- US $1500 w/original hardshell case SOLD! Rickenbacker 360/12 12-string Cherry Red 1991w-Rickenbacker hardshell flight-case NEAR-MINT! This guitar is nearly brand-new. I bought it from the original owner who never learned guitar as intended, therefore never played it. I only bought it as a companion for my 360 Cherry 6-string, and other than testing it, I've never played it either! Asking Price- US $1250 with original Rickenbacker flight-case SOLD! I've had this for about 2 years, and have used it in some recordings. and of course that SUPERB Rickenbacker sound! The beautiful Atlantis model was discontinued in 2001! This one's in superb condition. Needs a cleaning but it's in great condition otherwise, a great guitar. I've had this for about 6 years, and I've used it in some recordings. This model has the non-glossy 24-fret fingerboard neck-thru-body, a wider neck model than most Ric's, and of course that SUPERB Rickenbacker sound! Asking price- US $575 w-original Hardshell Ric Flight-Case SOLD! Solid 1-piece mahogany body with ultra-rare African Bubinga-wood cap. Made only 1999-2001. Intricate mother-of-pearl headstock inlays. Solid mahogany neck with rosewood fretboard. Basically identical to Epiphone LP Standard. Made exactly to specifications of the original 1959 Les Paul's, and it plays just like one. List price was $900. Several minor wear-marks on body rear, otherwise like-new, no longer made, very in-demand and collectible. I'd planned to put Gibson humbuckers in, but the factory-installed ones are really pretty decent. Same ones as on Epiphone's I believe. Samick is the largest guitar-manufacturer in the world and now owned by Gibson, they make Epiphone's, asian Fenders, you name it. Read the incredibly great reviews at Harmony-Central Guitar Reviews ! Asking price- US $600 no case-- Very rare bubinga & collectible! SOLD! The Artist guitar model was made by Samick Korea, to exact specifications of the original 1959 Les Paul's, and it plays just like one. List price was $900. Nearly identical to the Samick-made Epiphone ENL-4 but nicer looking headstock. Samick models were made 1997-2001, Epiphone's 1998-2000 only. SET-NECK (mahogany one-piece), Ebony Macassar-wood fretboard, Body 2-piece Indonesian mahogany with solid maple cap. Superb low action! Great as a 6-string if you wanted, as well! I list this guitar here occasionally but usually end up removing it if it doesn't sell in a short time. Several minor wear-marks on body rear, missing pickguard; otherwise like-new, and hardly played, superb for an 11-year old guitar. Model no longer made, very in-demand. Read the reviews here at Harmony Central! Asking Price- US $475 no case SOLD! Yes, amazing-- Valley Arts Center (a Gibson brand) offered a special-order run of these guitars in the Mary Kay finish! They even came with a fluffy fuzzy rainbow-color guitar strap which our cat tried to kill, and I gave it to someone. It also came with a special black stand, which I'll include (nothing special about it, see the photo). Has Gibson Deluxe tuners; needs a truss-rod coverplate; minor paint-flaking on cutaway, otherwise little wear. Read carefully! This is the body and neck, which have both been well-sanded to bare wood, and the body top is separated from the rims and bottom. Very well-done by a luthier who ran out of time and had to move. It also includes the typical Univox odd-sized toggle plate (tortoise-style) and chrome jackplate. That's it. I bought a full version of this guitar (click here for photos of it) about 6 years ago and the seller also had this kit project which he hadn't finished because he had to shut down his workshop to move, so he asked if I wanted to buy it. He'd also cut openings for full humbucker pickups. Univox Japan (Matsumoku) made Bradley headstock-branded guitars as a house-brand for Veneman Music of Rockville Maryland (now Guitar Center). The only name-brand versions of this model that I've seen have been Kent's. I don't have time for cool projects like this these days, so I hope someone can have a great 12-string and a fun project with lots of potential for a great price! Or, swap on a different Univox/Matsumoku neck and make it into a 6-string or a bass. I just saw an identical 1960's Univox bass sell on ebay for over $400 (Feb'2009). 22-fret bolt-on neck, spruce top, mahogany back. The photo page shows various shots, some including various metal hardware etc. I may be using some of the hardware on other guitars here, or some of the parts may still be available. The white strips on the body-- IT'S JUST MASKING-TAPE and easily removed. Asking price- US $75 SOLD! Matsumoku Factory early 1970's product made for Epiphone/Gibson, Univox and others. Cool 6-pole adjustable chrome-covered humbucker-pickups that sound great, very popular and get lots of rave reviews. True hollow-body, with small center-block under bridge. Very well-made body. Very cool '60's bright yet throaty vibe sound. Pickup heights are adjustable, as are the 6 poles. They remind me of some 1960's Burns guitar pickups or the Dearmond 6-pole's. Adjustable-tension tremolo. Great action on the blonde-mahogany bolt-on neck. Asking price- US $400 no case SOLD! Univox Country-Gentleman or 335-style (Teisco Del Rey) Tri-Sunburst 1970's - MINTY! Very rare! I cannot find a single flaw on this guitar-- it's from probably early/mid 1970's. Under-bed item! All-original hardware. Matsumoku Factory product. Also marketed as Ibanez, Ventura, Conrad, Greco, Orlando. Cool single-coil 6-pole adjustable chrome-covered Dearmond-style pickups that are actually quality-constructed. Interchangeable with mini-humbucker or P-90 sizes. I'm impressed with these old '60's-70's Univox's. The same factory also made guitars for Epiphone when Gibson first moved its production to Japan in early 1970's. Very cool '60's vibe sound. Pickup heights are adjustable, as are the 6 poles. They remind me of some 1960's Burns guitar pickups or the Dearmond 6-pole's. Adjustable-tension tremolo. Great action on the blonde-mahogany bolt-on neck. Asking price- US $375 with HARDSHELL GIBSON-STYLE CASE INCLUDED (missing handle) SOLD! Ventura Barney Kessel Custom 1970's! This guitar is a SET-NECK, and NOT a bolt-on like a lot of the other '60's-70's Asian clones! Also note that this guitar has the LAWSUIT-ERA open-book headstock! Really full deep sound! I was going to keep this rather than my real Gibson Barney Kessel, but now I'm ending up selling both of them, because I'm hardly using thicker-body jazzboxes very much. Thinner tapered-neck style, 37mm at nut, 46mm at 12th fret, 49.5mm at 20th fret Flatter on the rear than the broomstick-shaped mid/late 60's Gibson's. Replacement unknown Asian humbucker pickups, they sound incredibly nice, very warm and do a great job pulling out the incredible hollowbody sound. Condition-- a few small chips & dings on the rear & end of headstock; neck-heel finish cracking but seems structurally sound. Black headstock rear paint was factory-common on many of the models, copying the same Gibson effect used on many higher-end jazzboxes. Asking price - $500 no case SOLD! Gorgeous Gibson-logo headstock MOP inlay! This guitar is a SET-NECK, and NOT a bolt-on like a lot of the other '60's-70's Asian clones! Also note that this guitar has the LAWSUIT-ERA open-book headstock! Condition-- it looks as though someone took a near-mint guitar put a whole lot of work into creating a fully Gibson-Custom clone. Asking price - $300 includes body/neck and bowtie inlays ONLY (no metal hardware or parts); no case SOLD! Fantastic! Not just a historic 150-year old relic, it's also a playable guitar! Decent condition. Note the diagonally-cut fretboard. This was a trick used by some guitar manufacturers on mass-contracts, to save money (especially on the government, things haven't changed!) since they could save a few inches of fretboard-wood between two neck-lengths. The guitar has the usual wear and tear of a guitar of this age, and given its use in the Civil War the various modest cracks on the surface are not unusual, but they are very stable. Some may have been repaired, I haven't had it assessed professionally. It has the original real IVORY tuning-keys. The guitar even has someone's initials scratched in next to the body next to the left bass-edge of the fretboard-- "HMB." Asking price - $1250 SOLD!